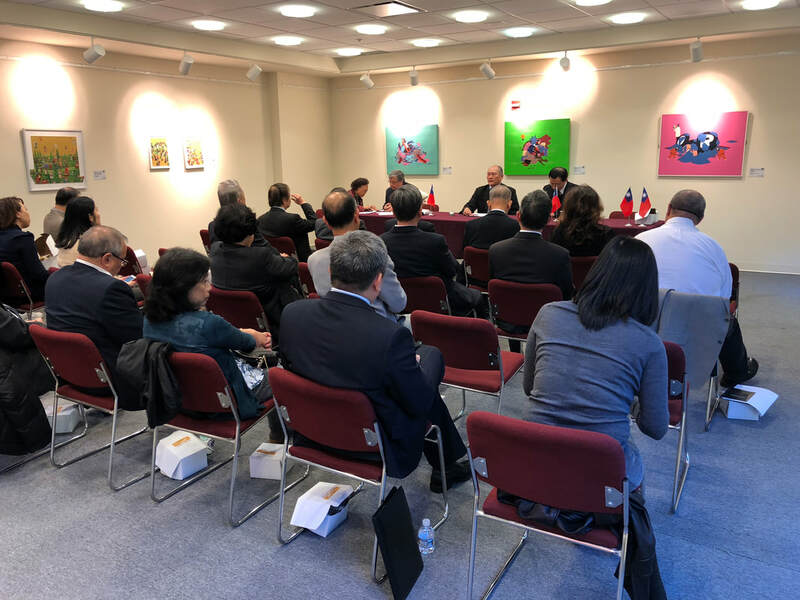 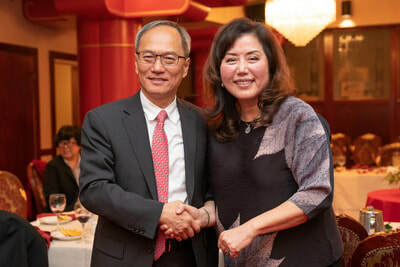 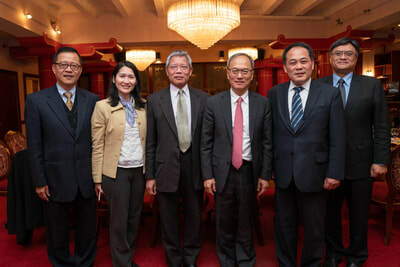 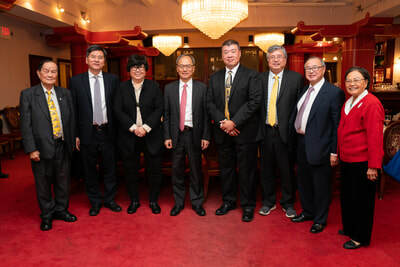 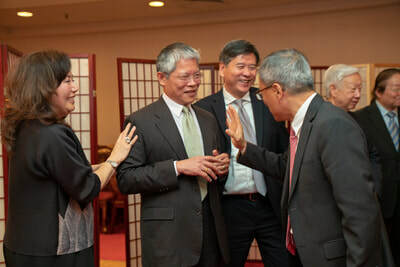 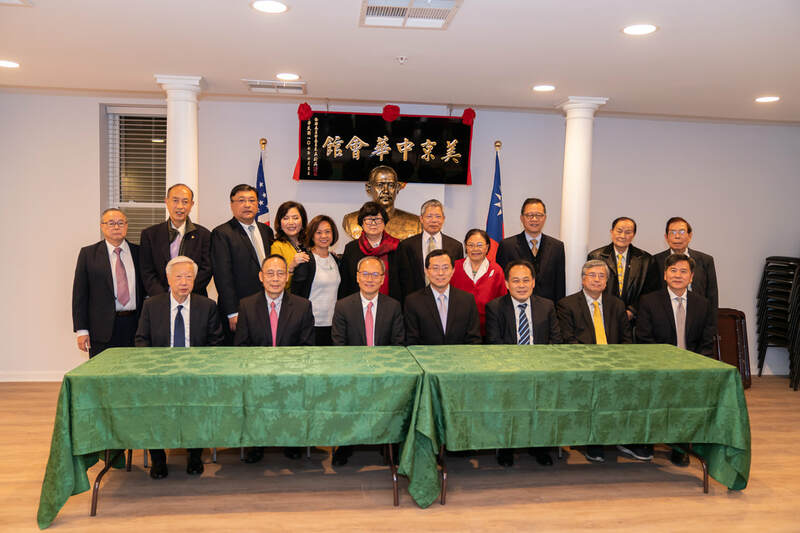 11/09/18 - CCBA welcomed Minister Wu from the Overseas Community Affairs Council, Republic of China to Washington, DC. 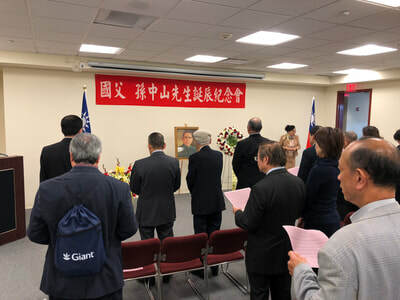 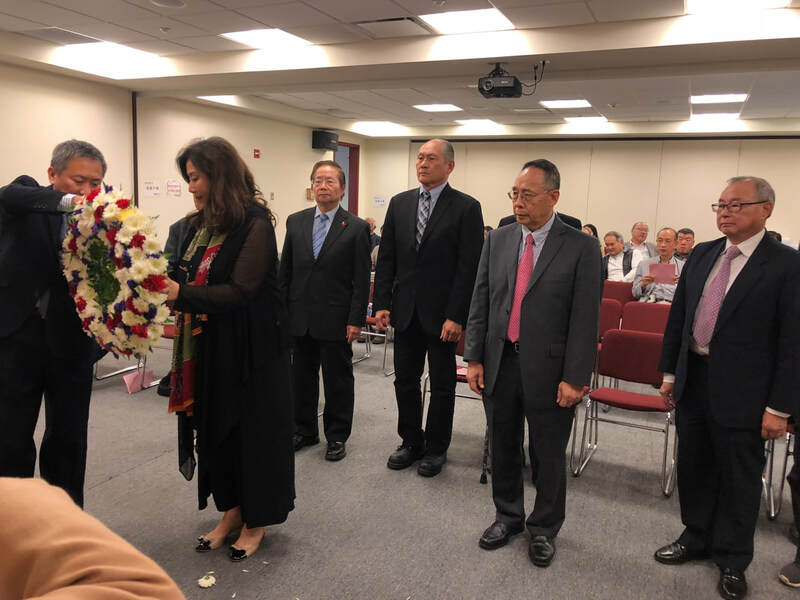 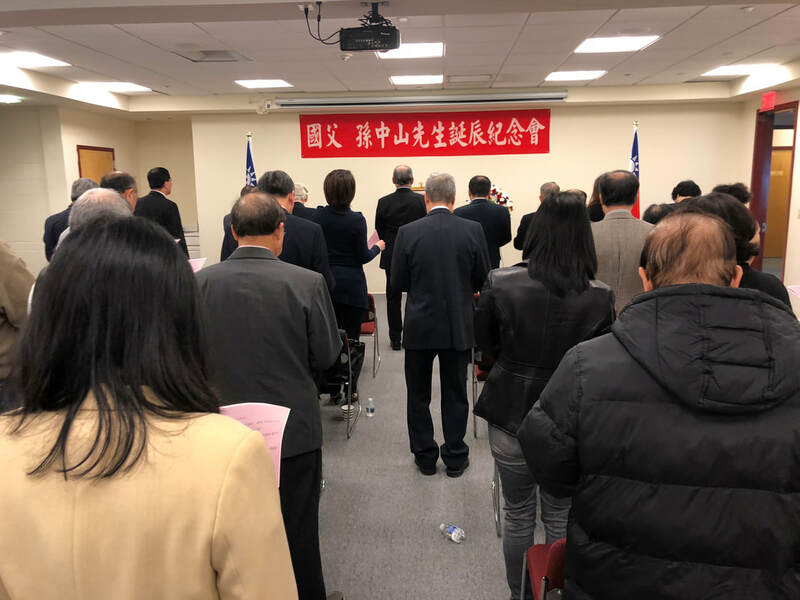 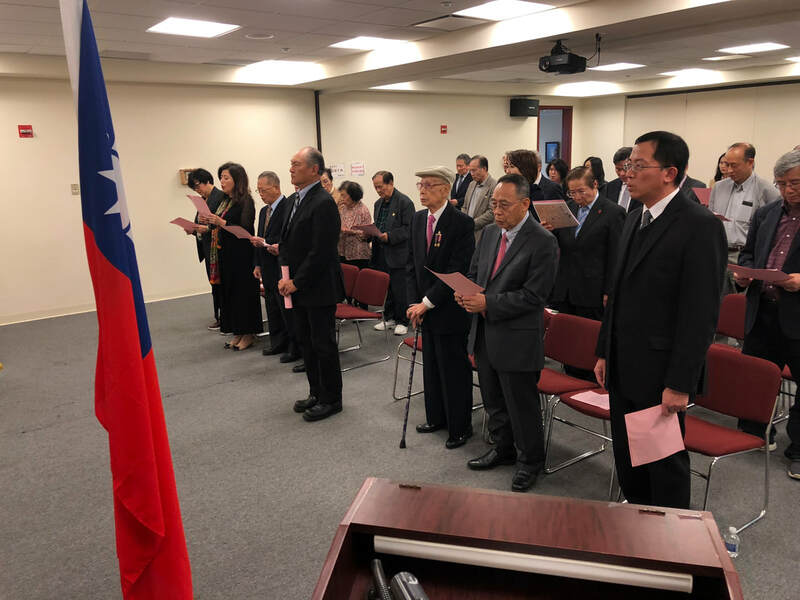 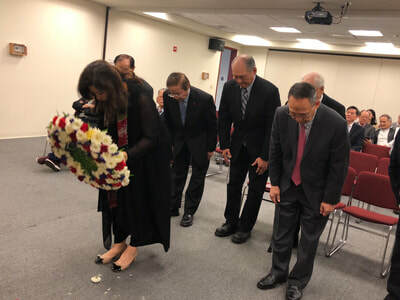 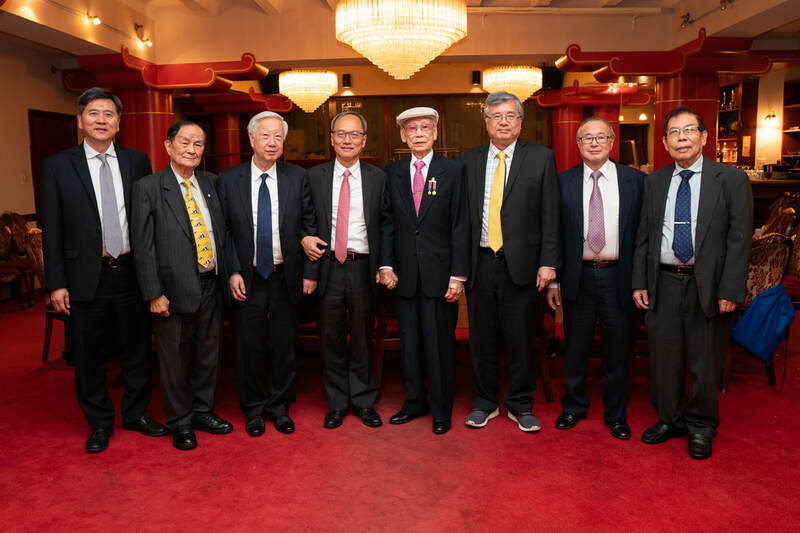 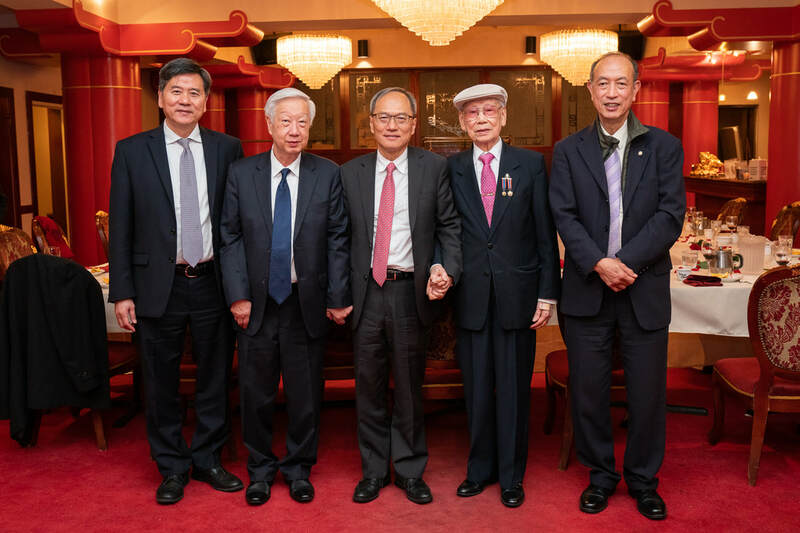 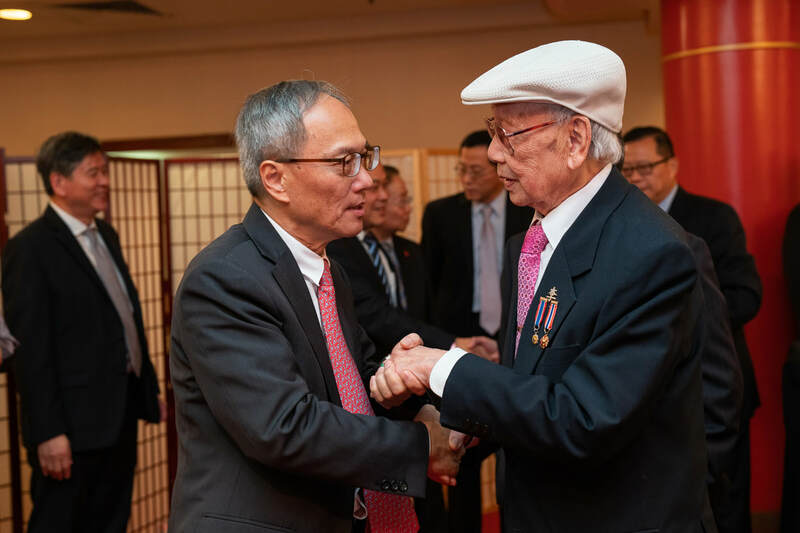 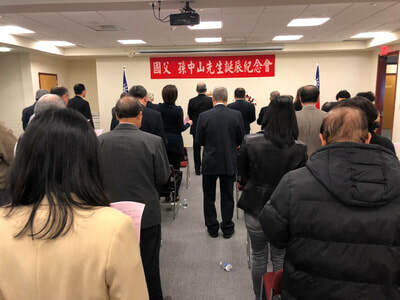 11/04/18 - CCBA representatives pay respect and celebrated Sun Yat-Sen's birthday at TECRO and conducted their November monthly meeting at their facility. 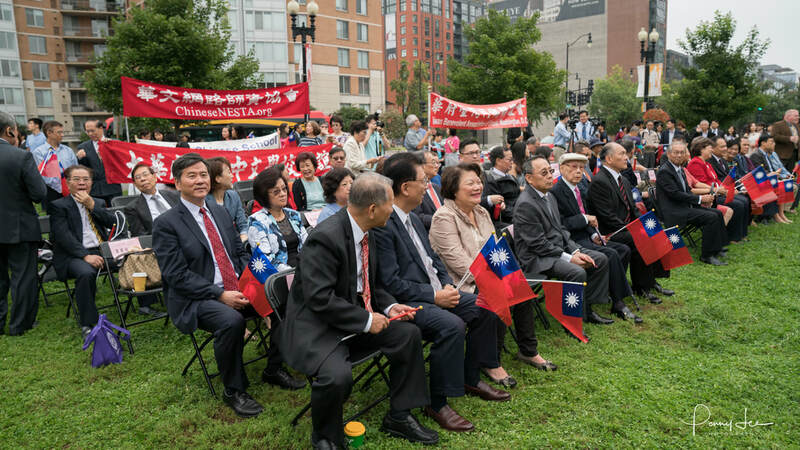 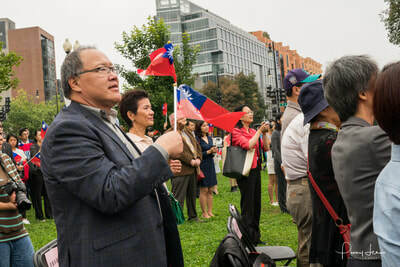 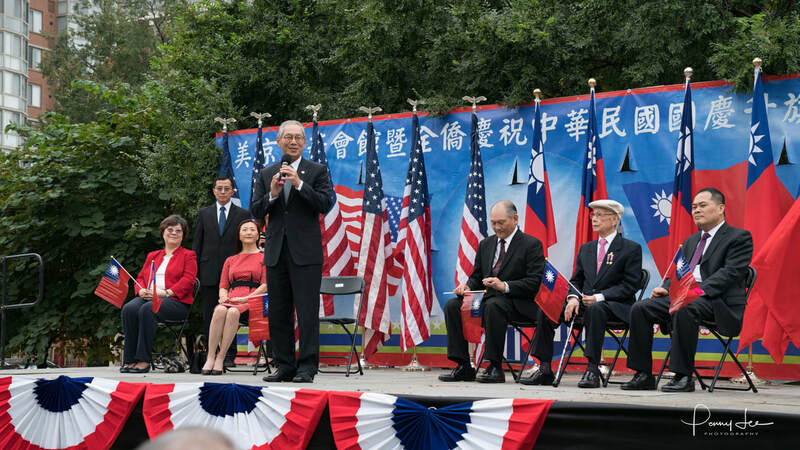 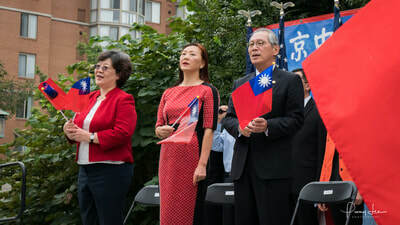 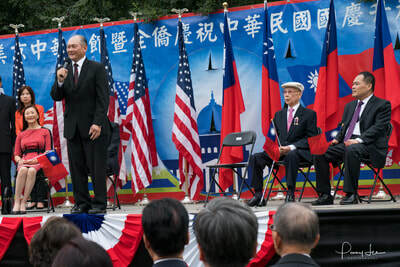 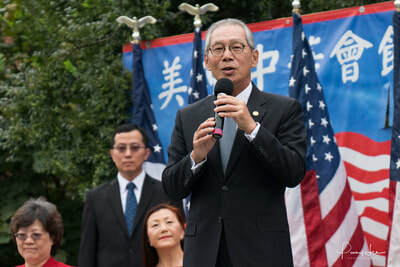 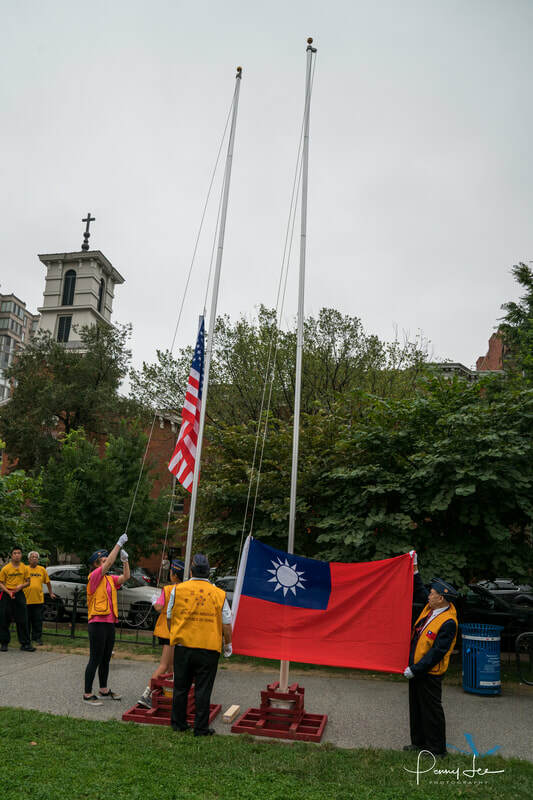 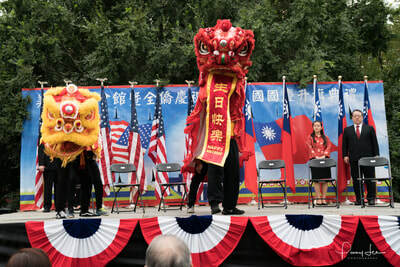 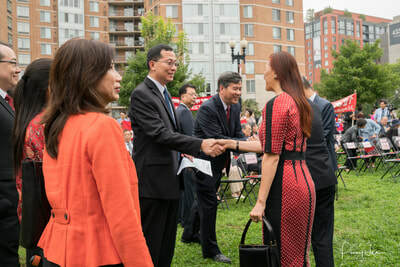 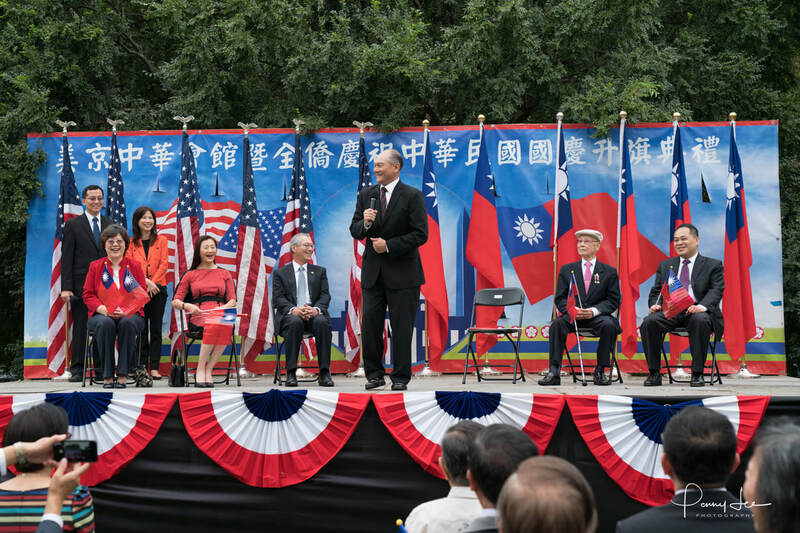 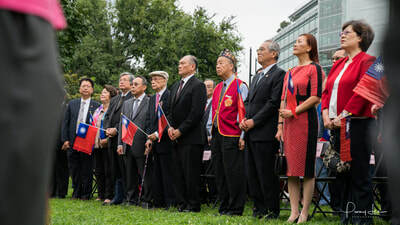 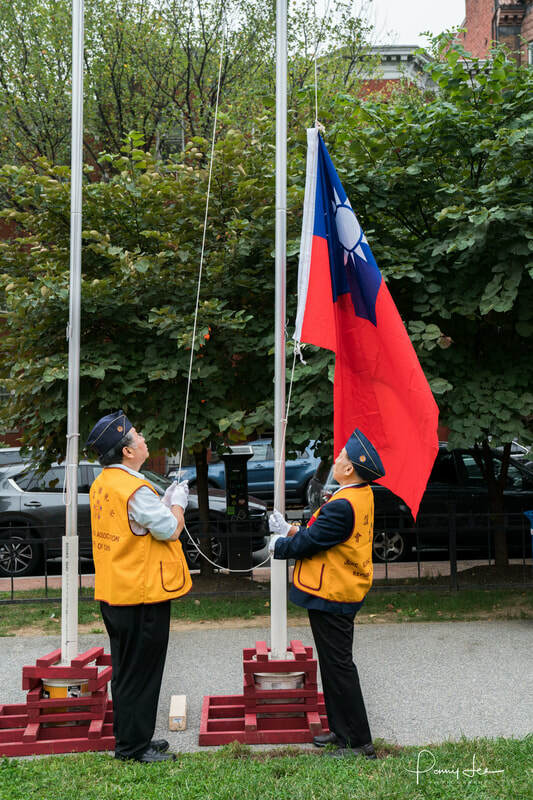 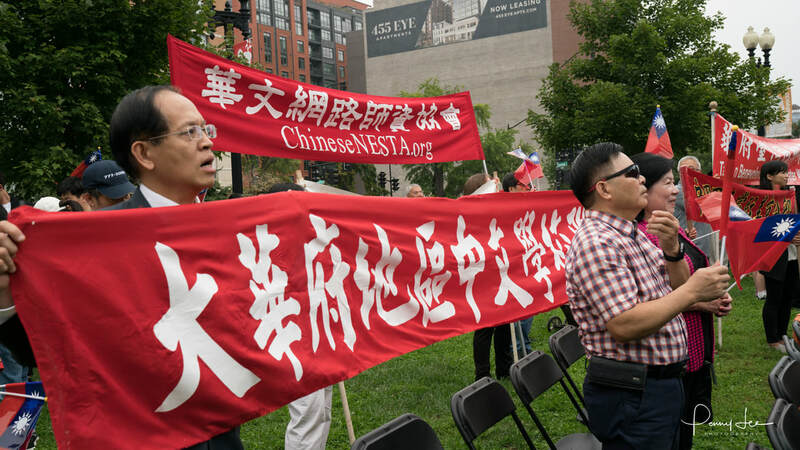 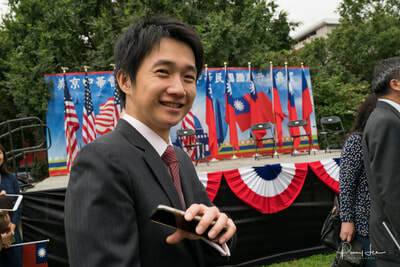 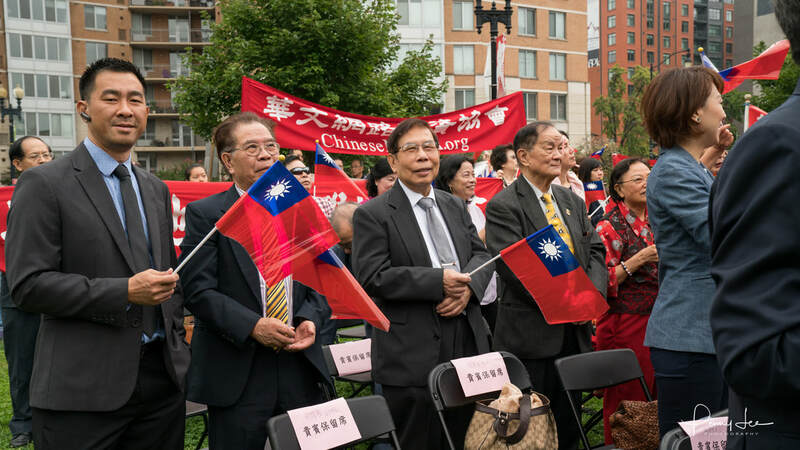 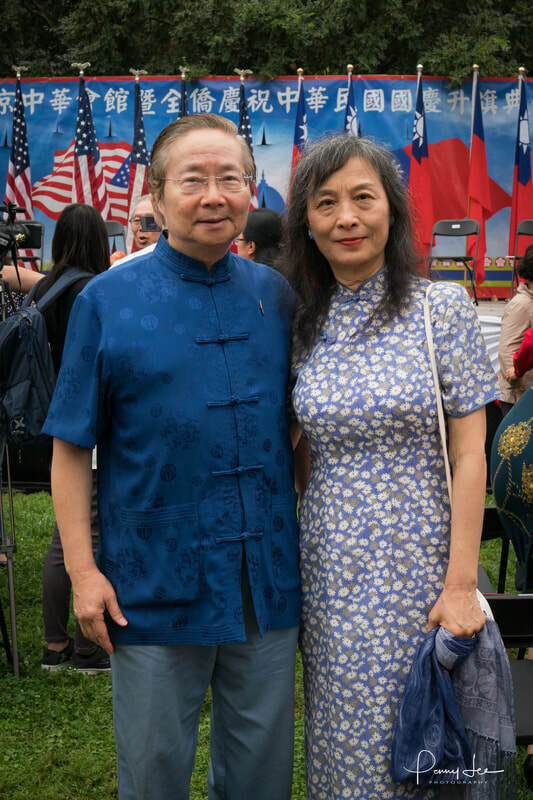 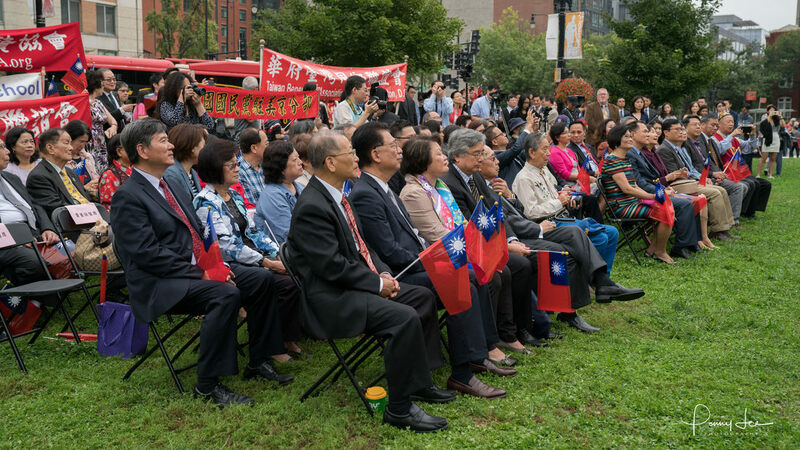 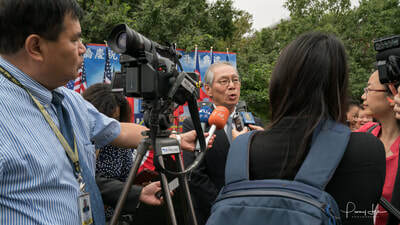 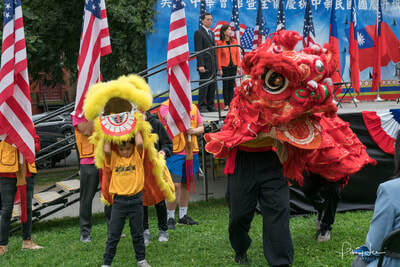 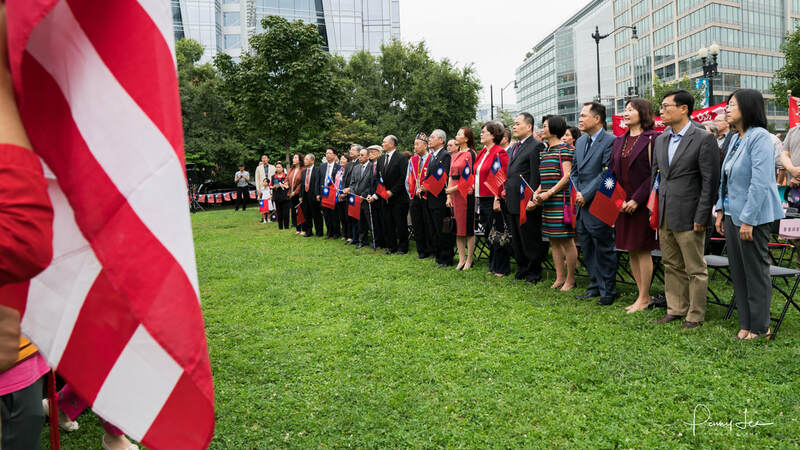 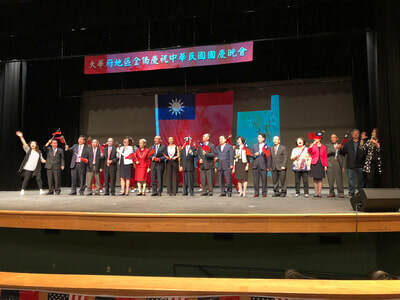 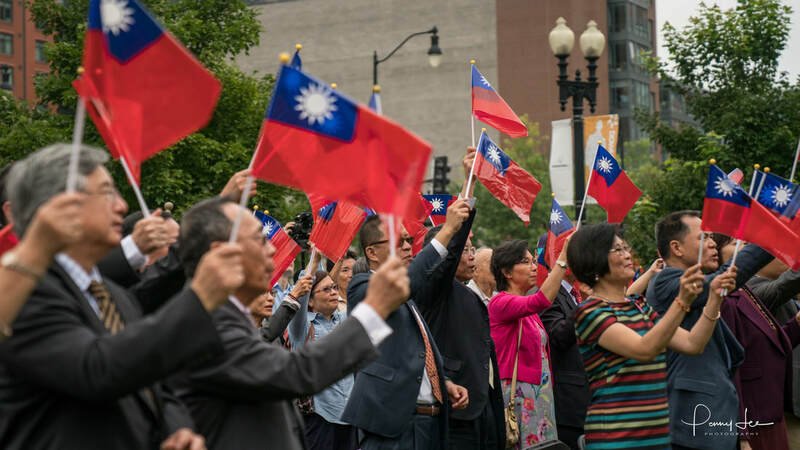 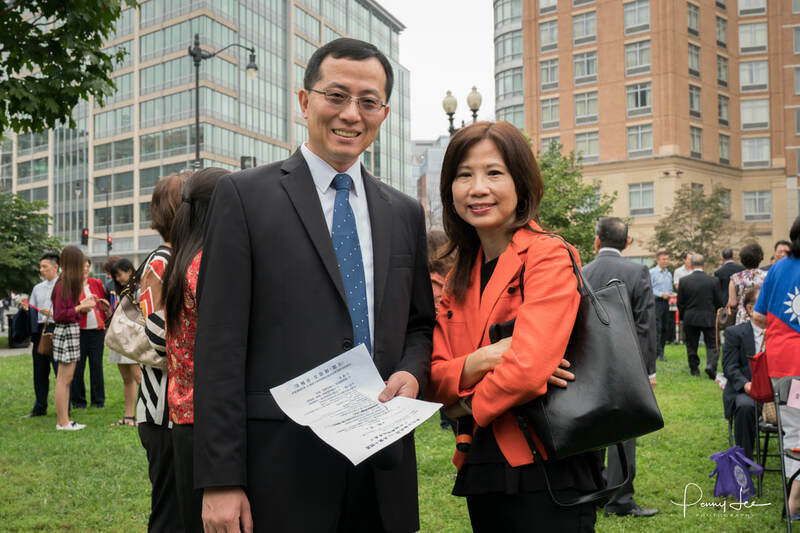 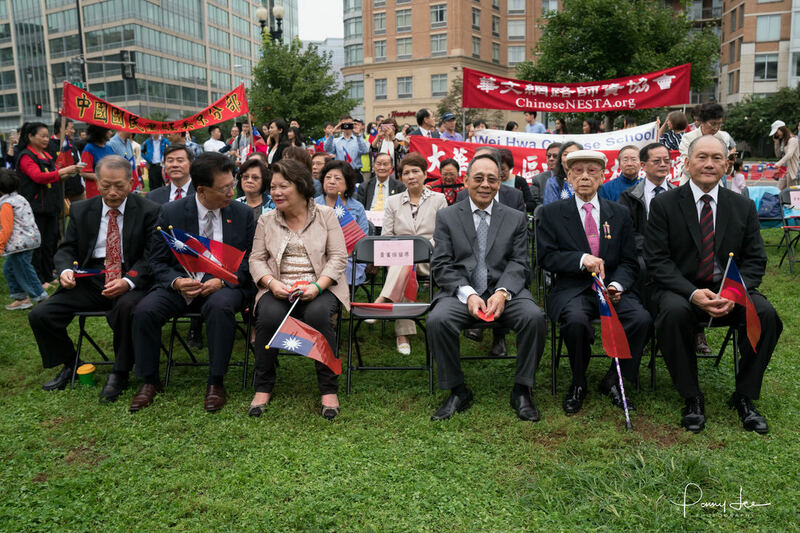 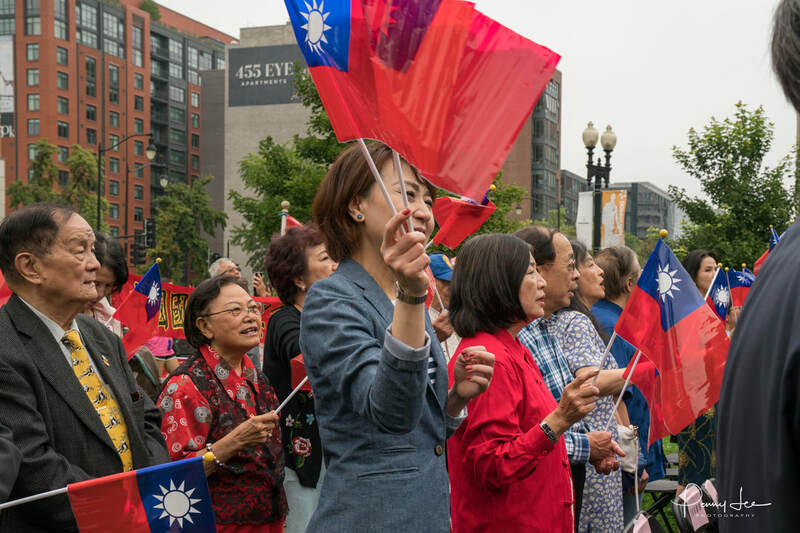 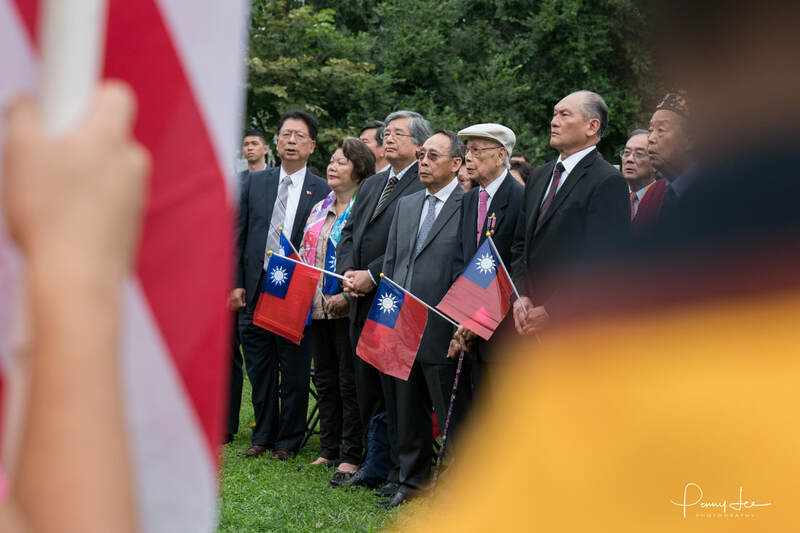 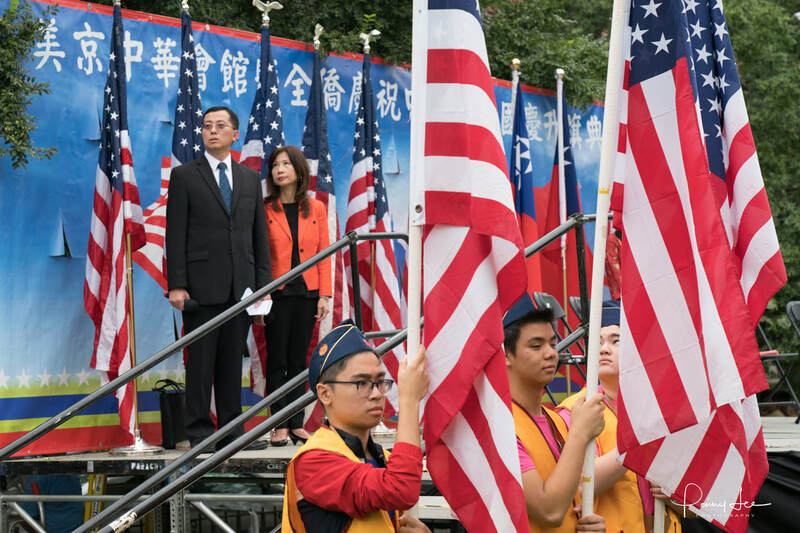 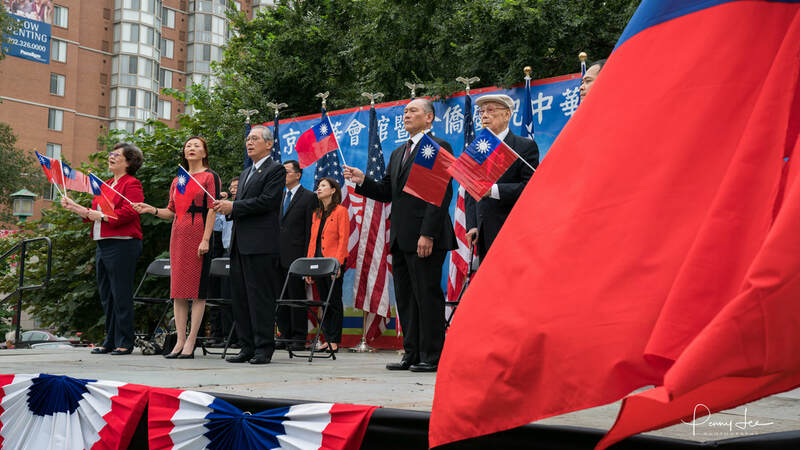 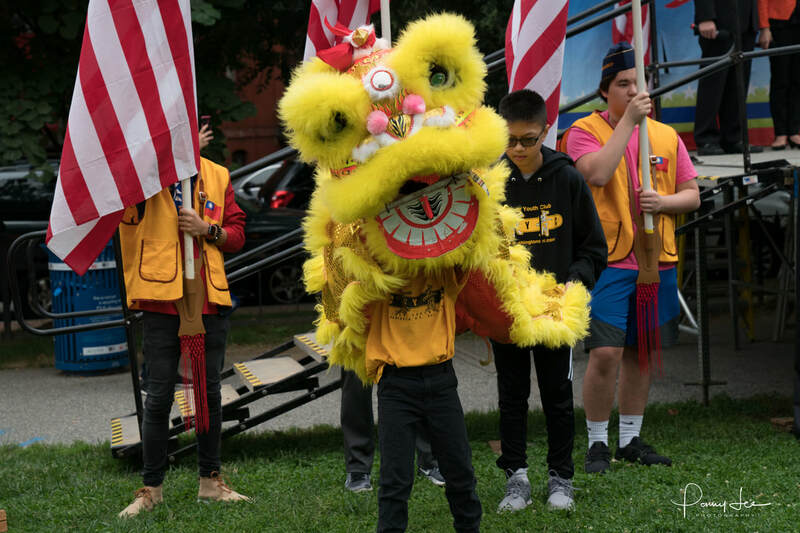 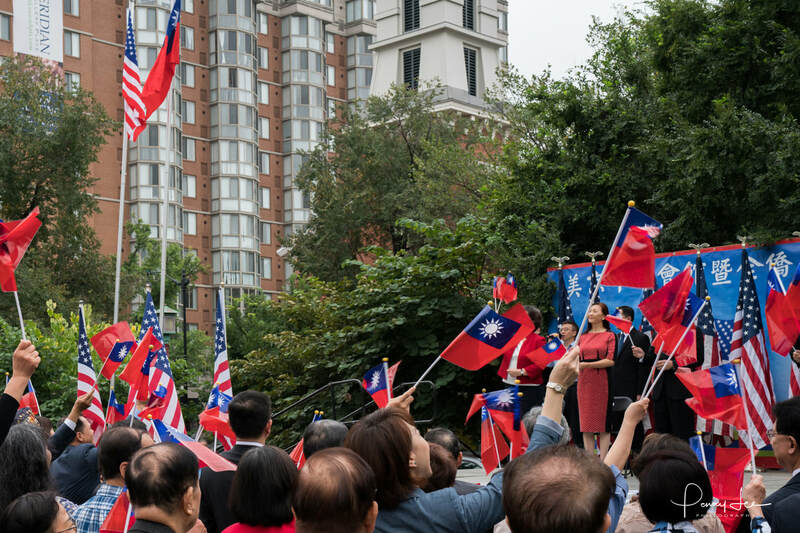 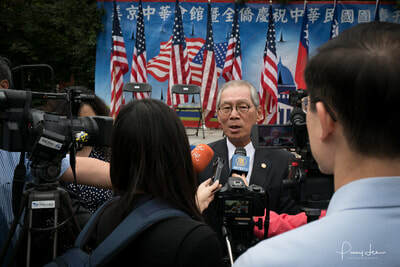 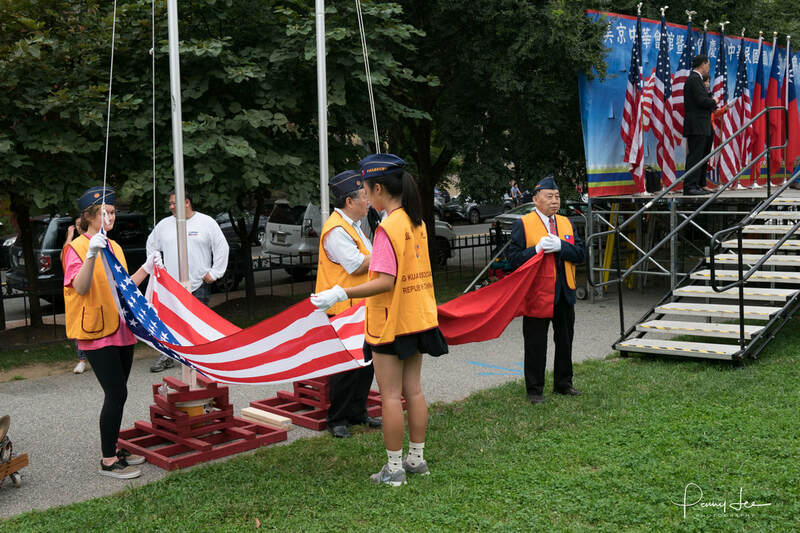 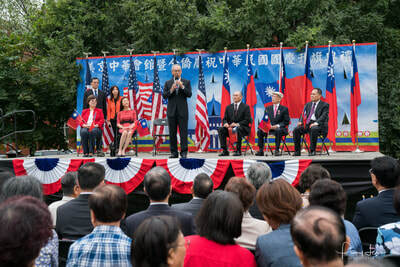 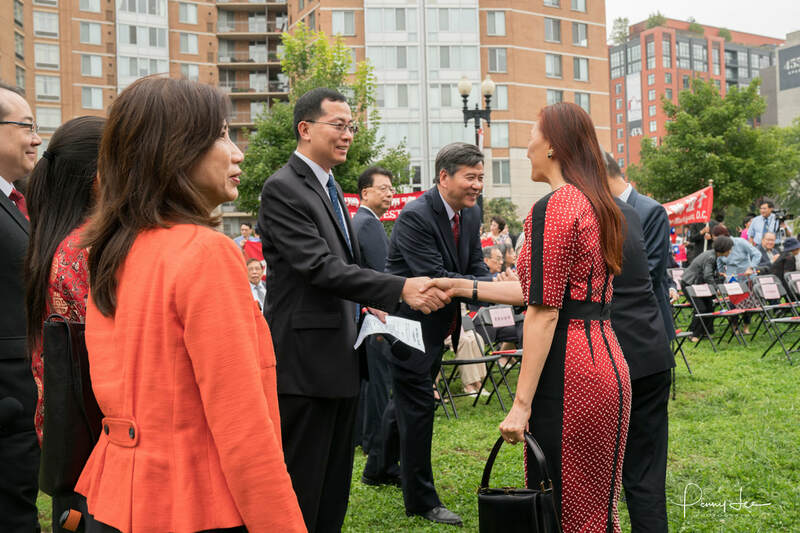 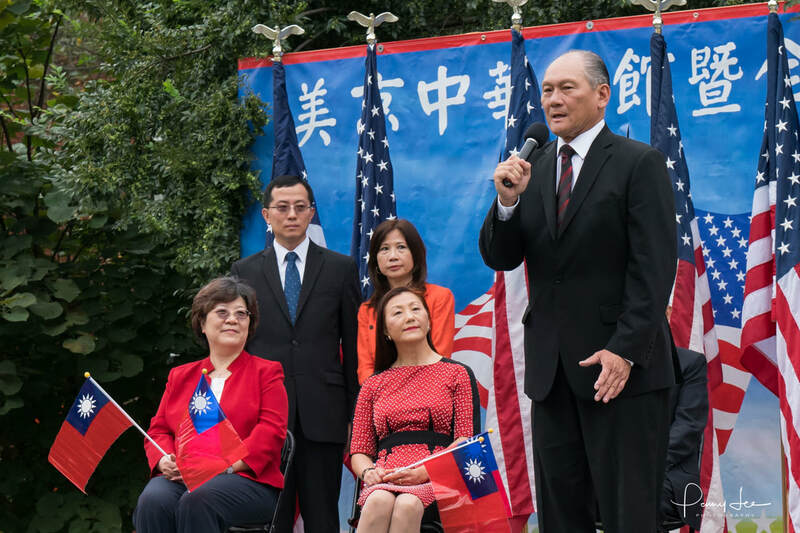 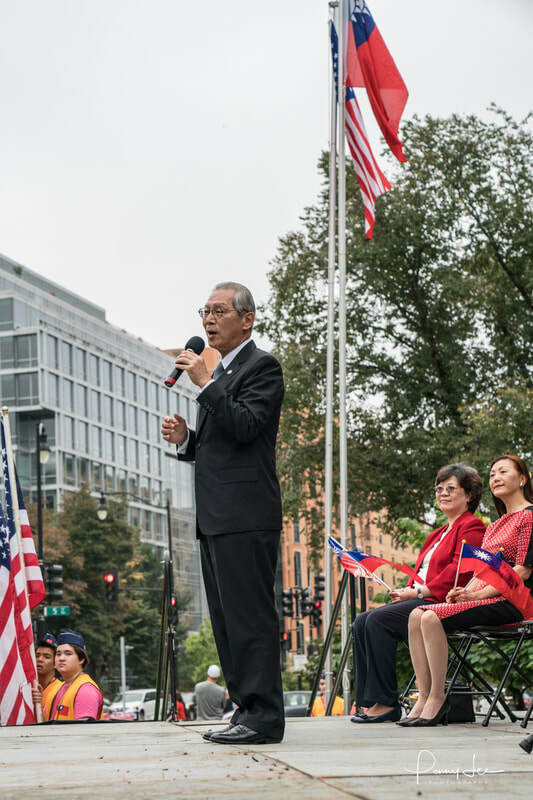 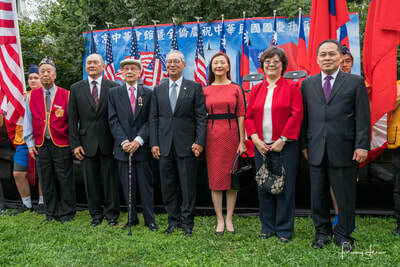 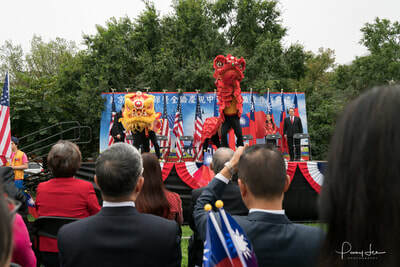 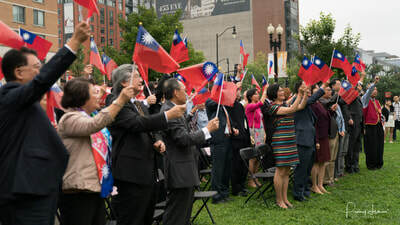 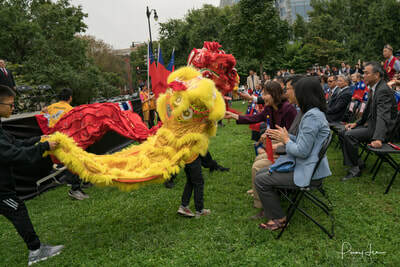 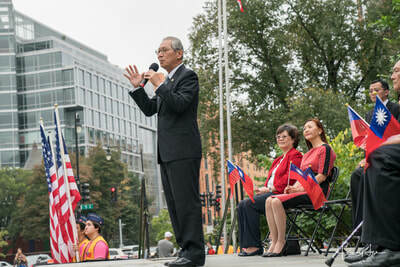 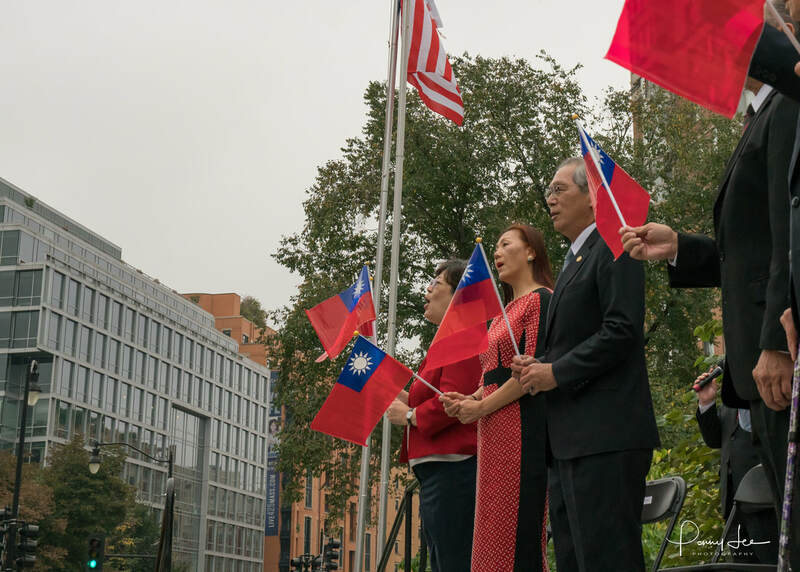 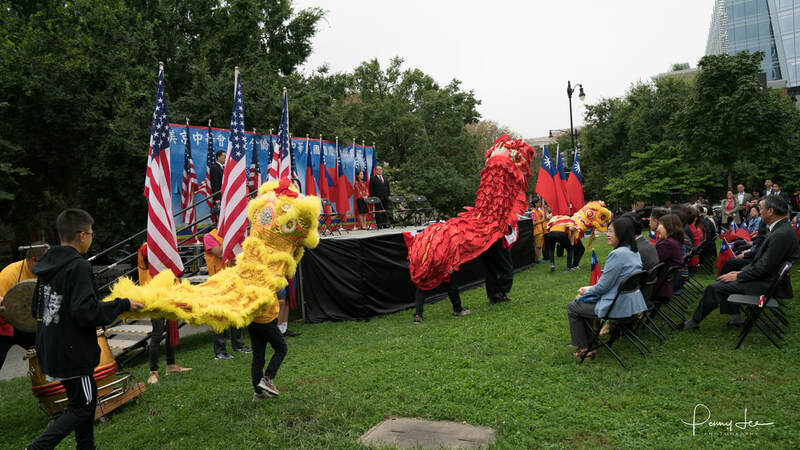 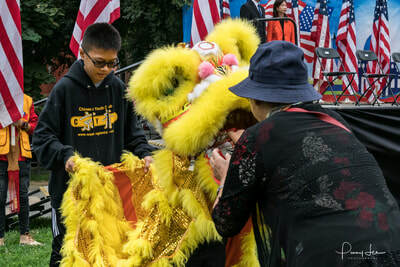 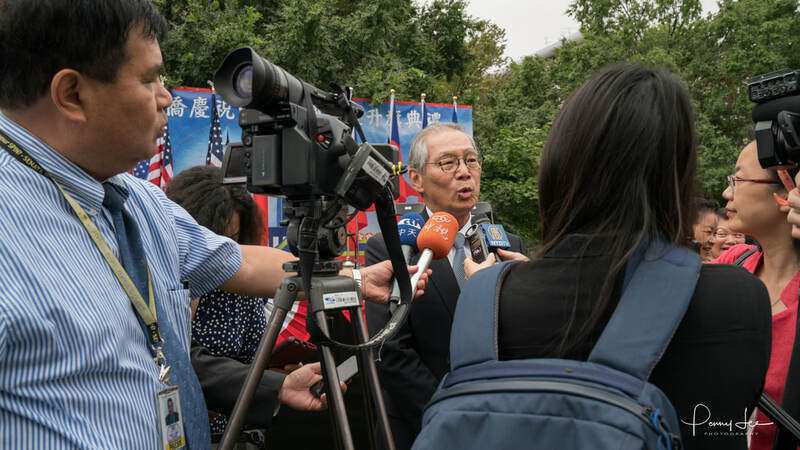 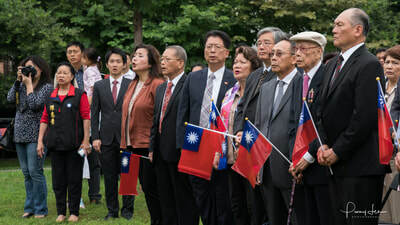 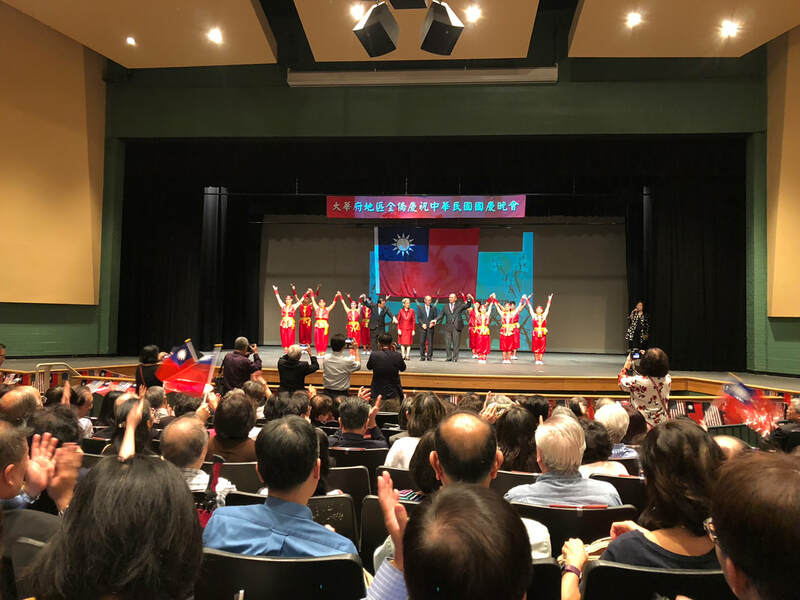 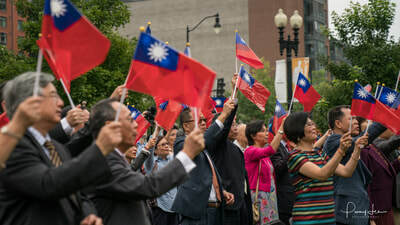 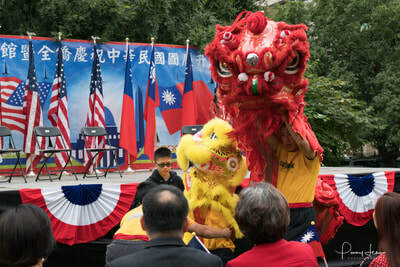 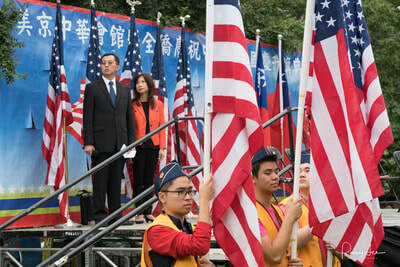 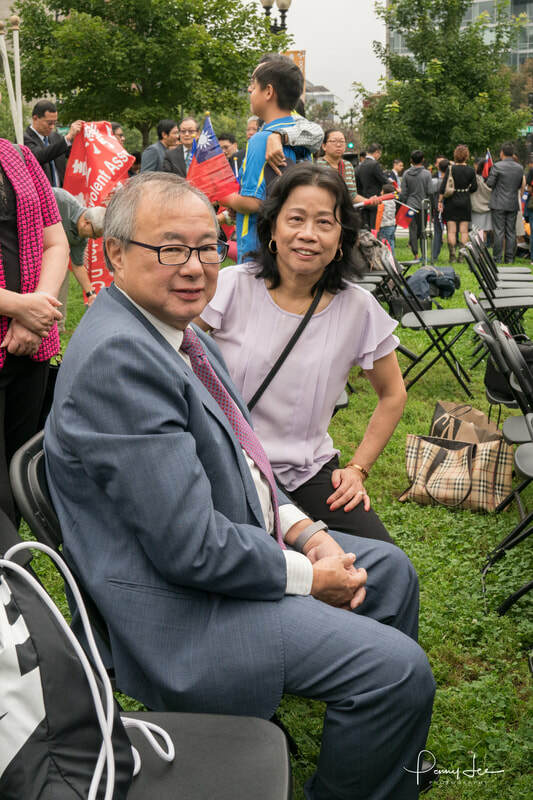 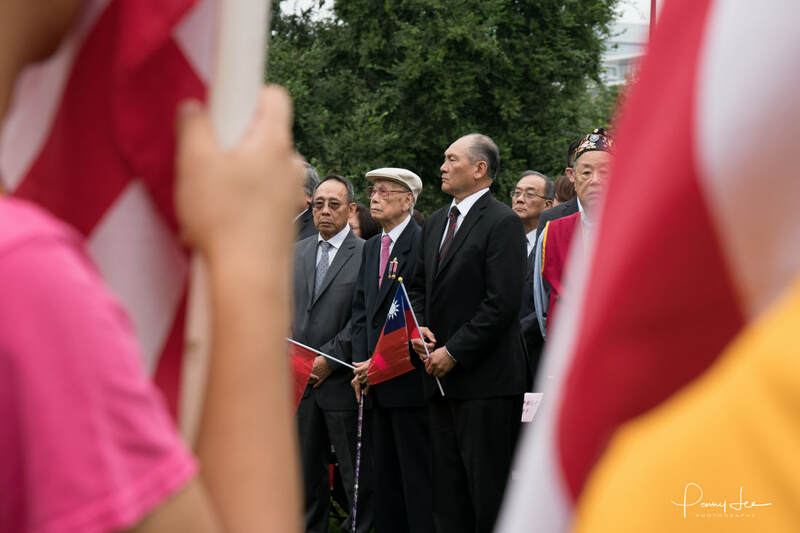 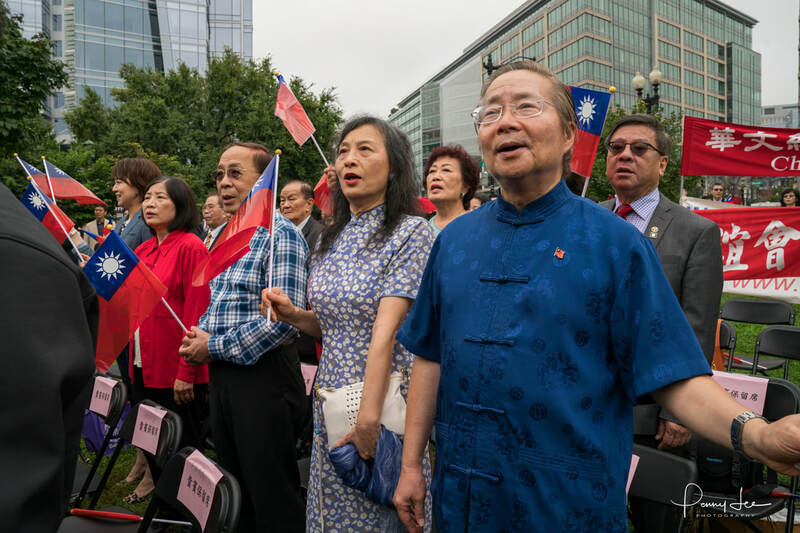 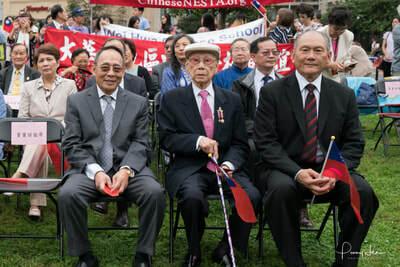 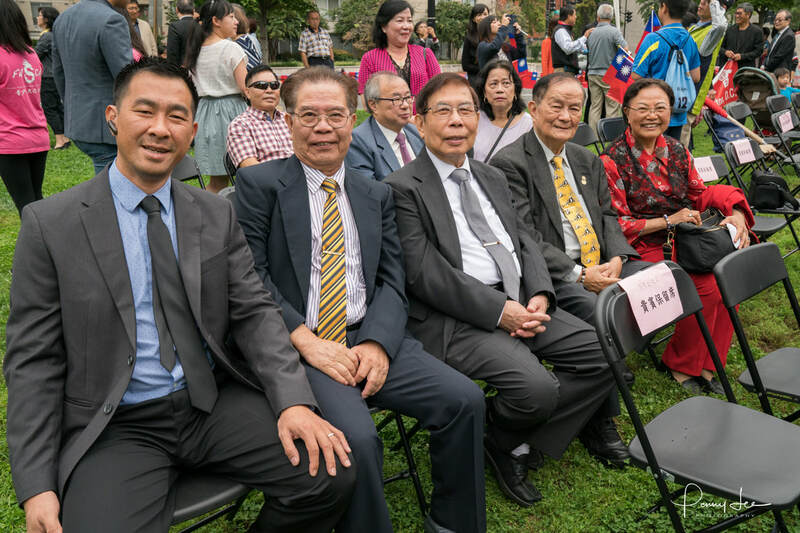 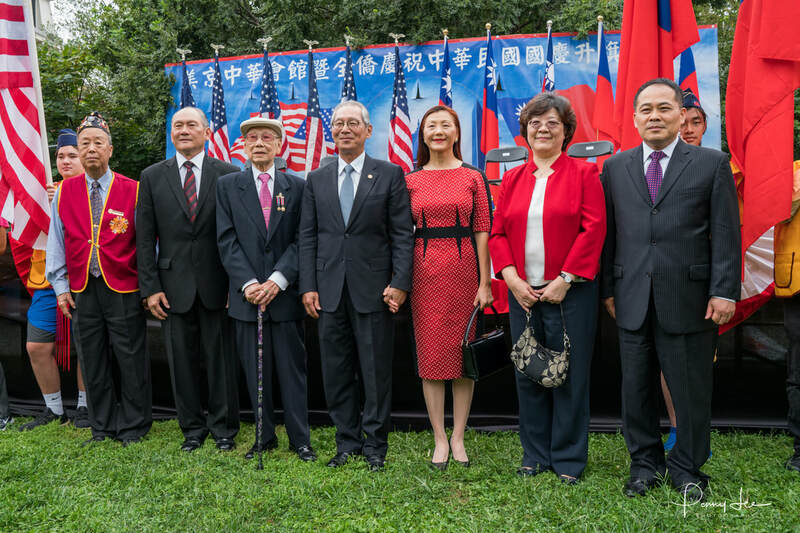 10/07/18 - To celebrate the Republic of China's 107th Birthday, a flag-raising ceremony was held in Washington, DC Chinatown with Taipei Economic and Cultural Representative Office (TECRO) in attendance along with many guests, spectators and media reporters. CCBA Chairman Wallace Lee and TECRO Representative Stanley Kao made speeches. 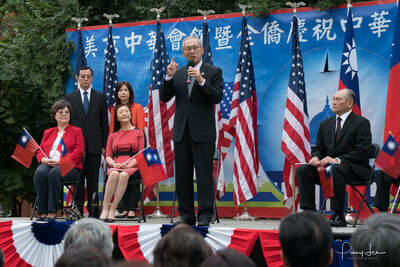 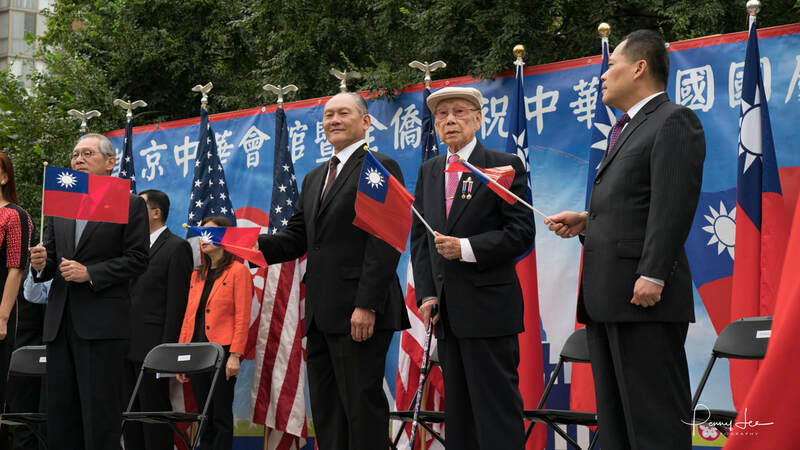 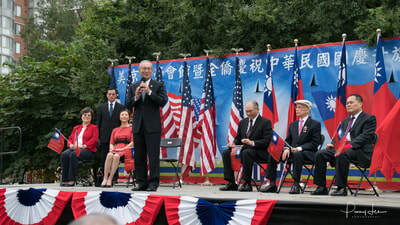 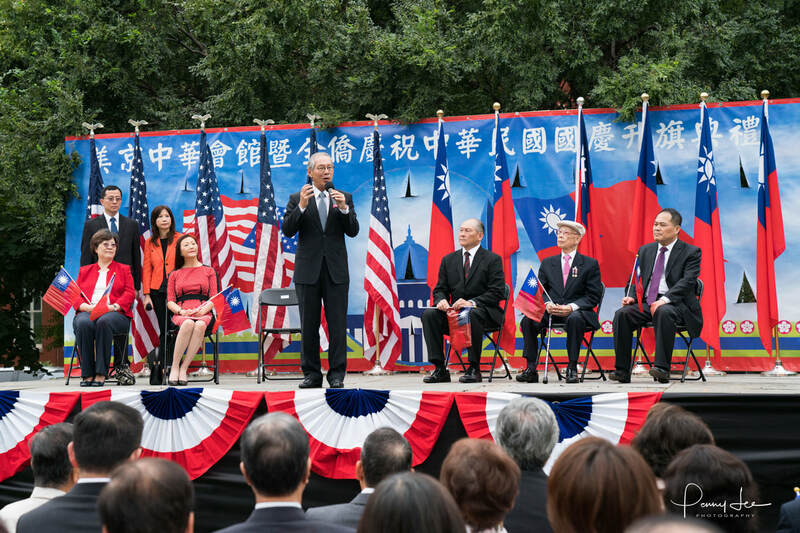 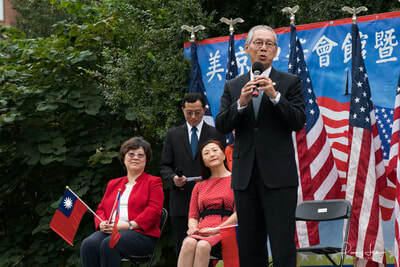 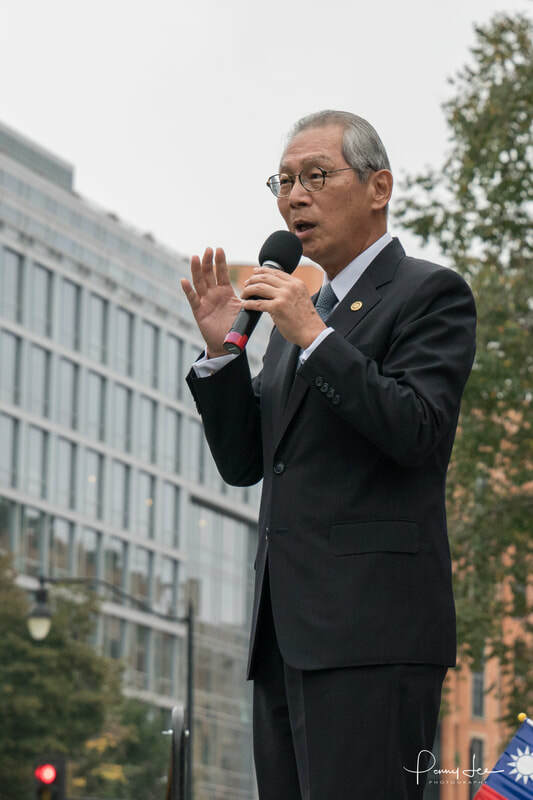 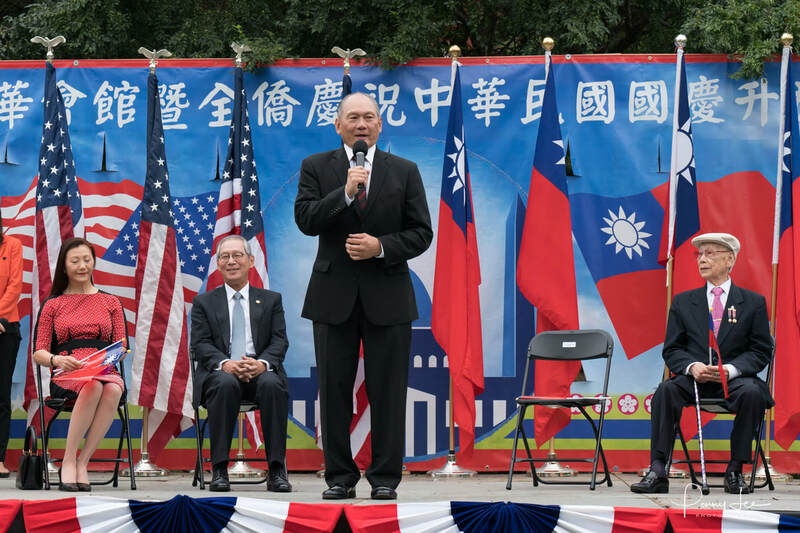 Representative Kao said, "Taiwan is a key partner of the United States. 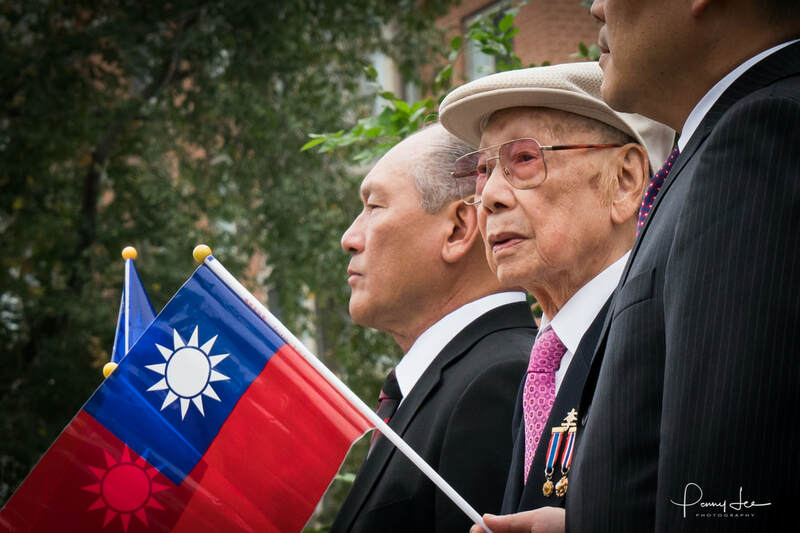 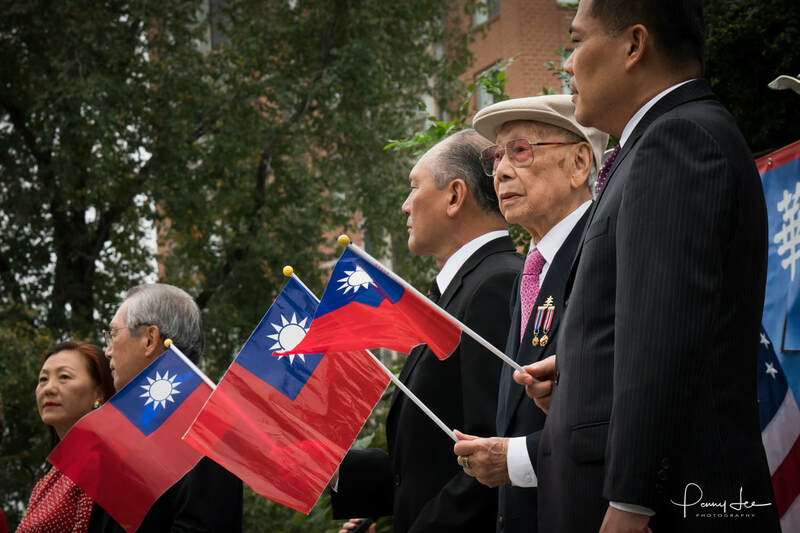 Taiwan is a story of successful democracy. 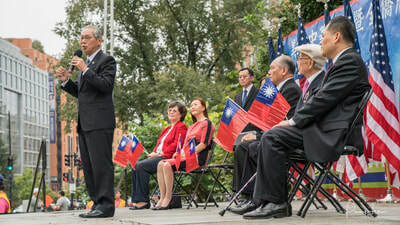 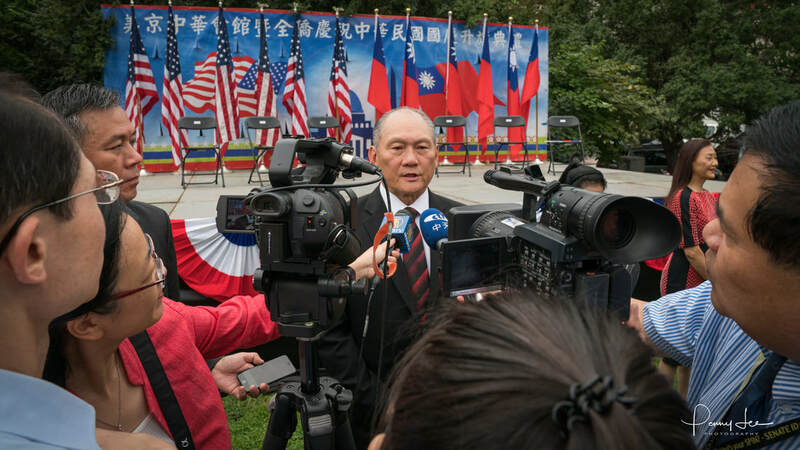 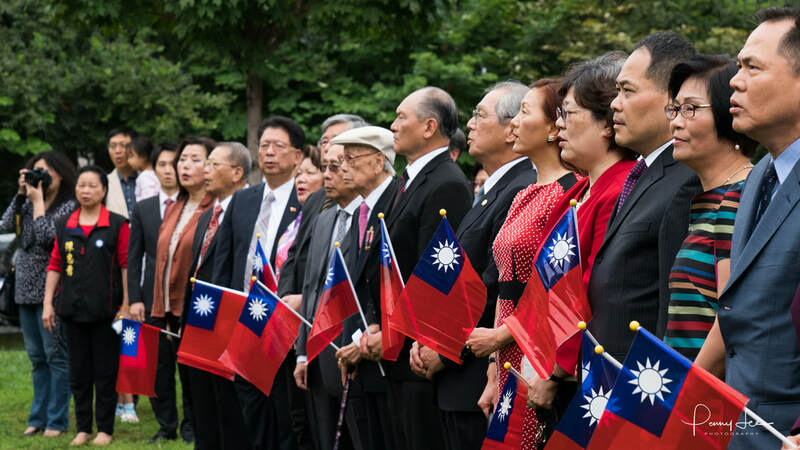 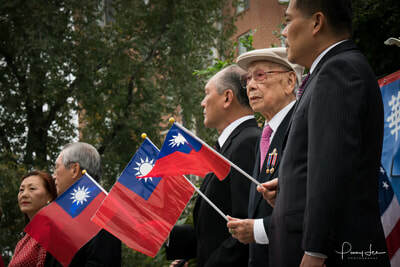 Taiwan is a good and positive force in the international community." 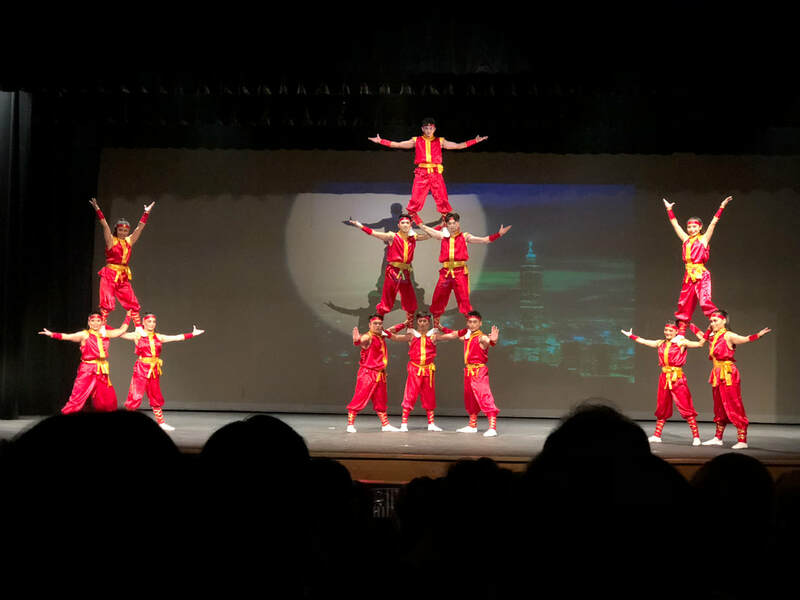 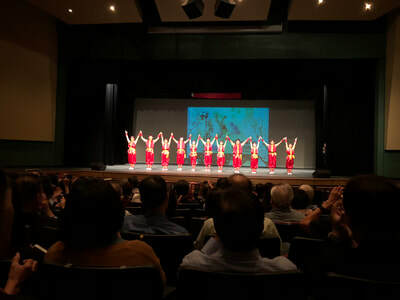 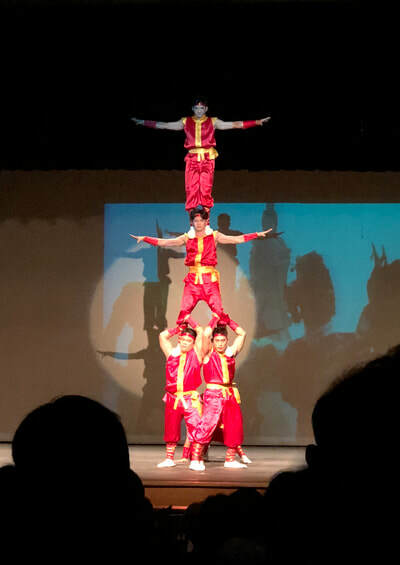 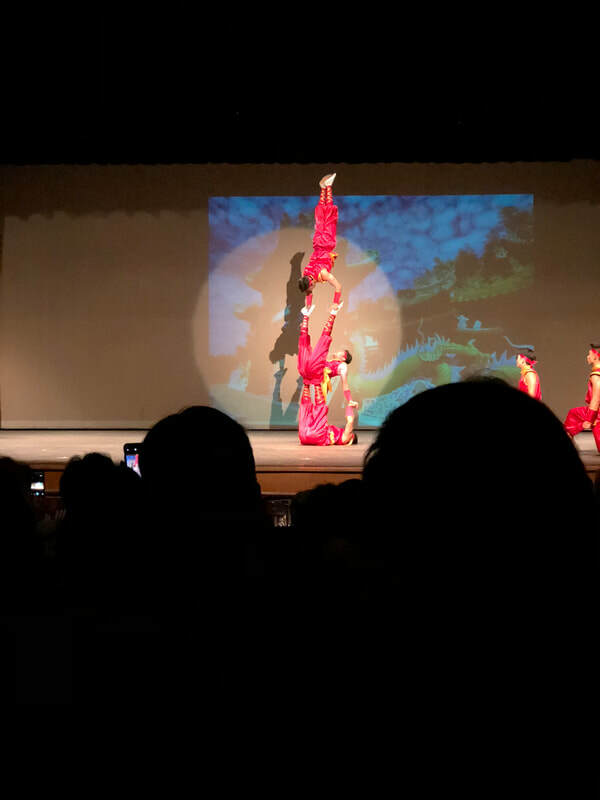 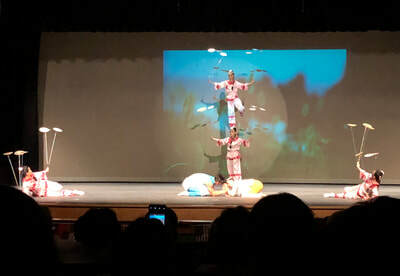 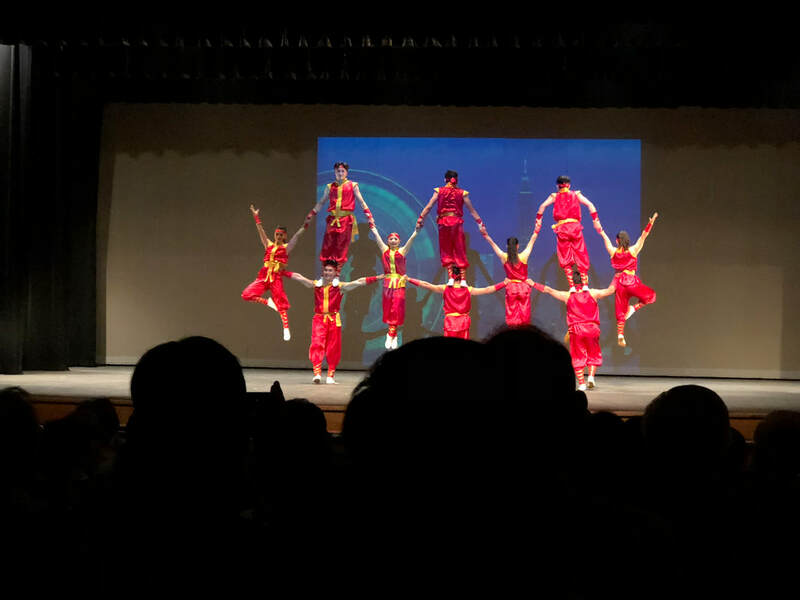 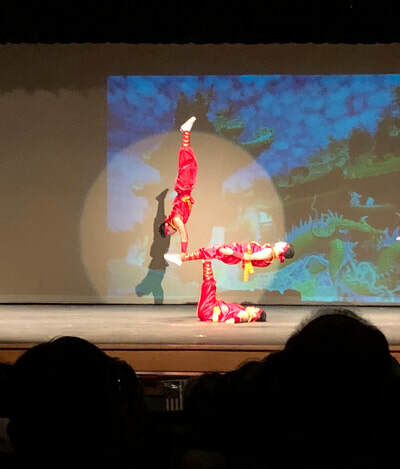 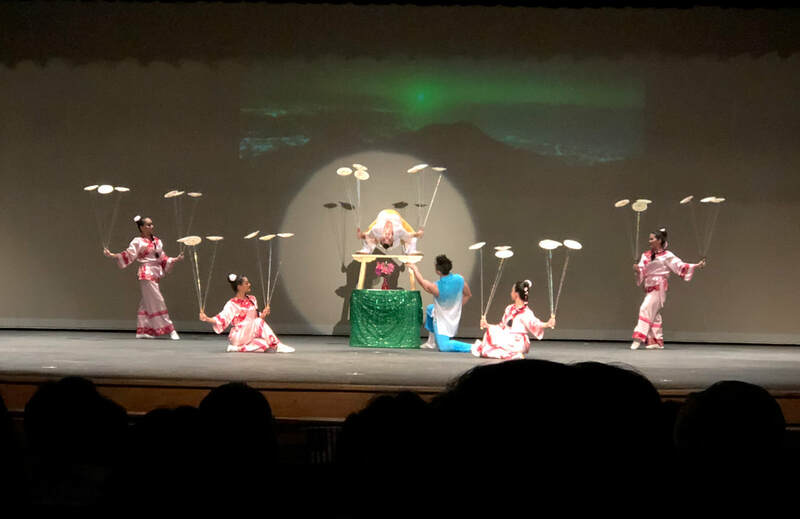 9/26/18 - Taiwan Acrobatic Troupe of National Taiwan College of Performing Arts, founded in 1990, is currently the only official acrobatic arts and stunts performing group in Taiwan. 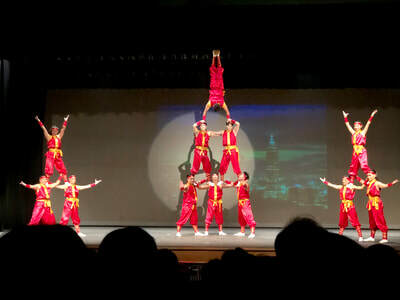 The troupe consists of young artists who have received training for more than eight years. The troupe members have performed extensively around Taiwan and invited by the government to perform abroad in many countries. Their performances have promoted the excellence reviews worldwide. CCBA co-organized this event. 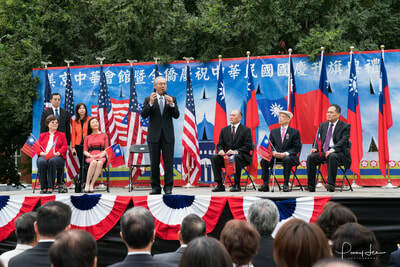 Sponsored by the Overseas Community Affairs Council (ROC) Taiwan. 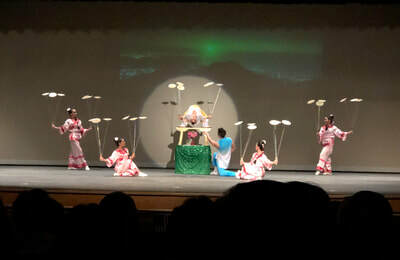 Here are some short clips of the performances from that evening. 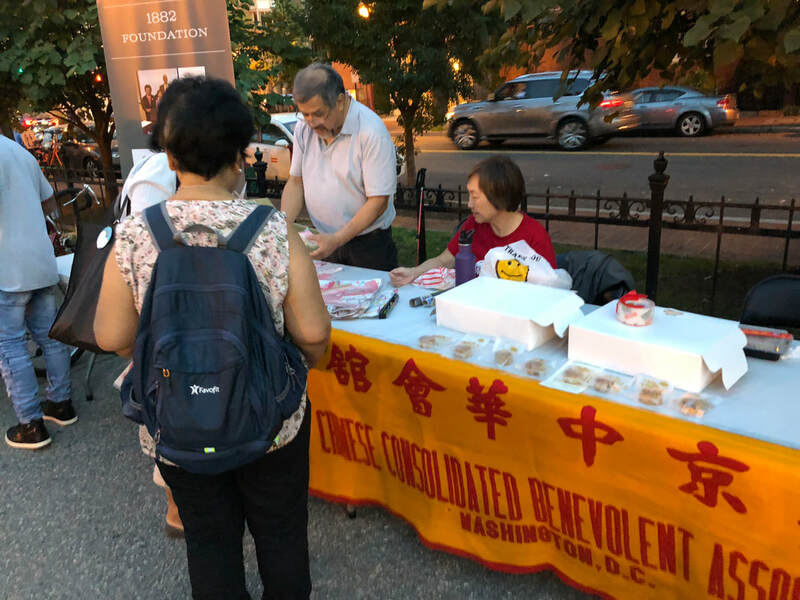 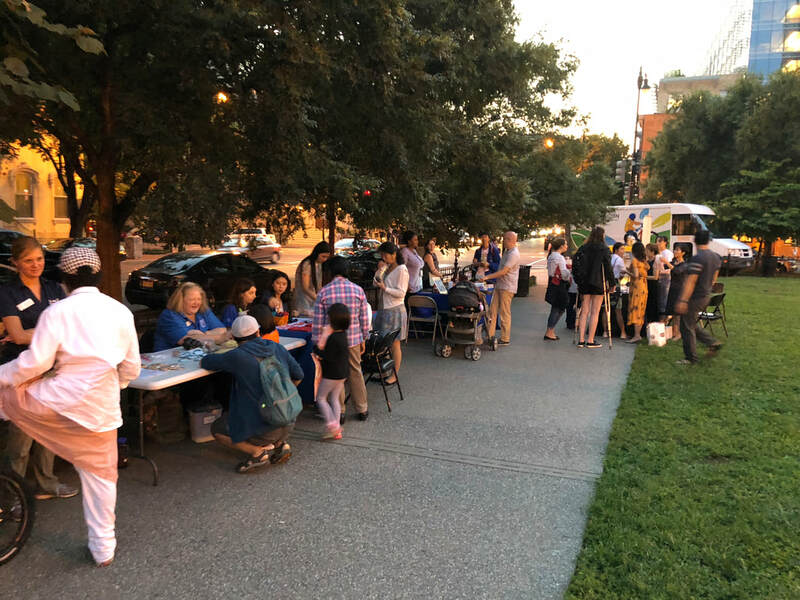 August Moon Celebrations - Dinner boxes were given to residents at the Wah Luck House in Chinatown. 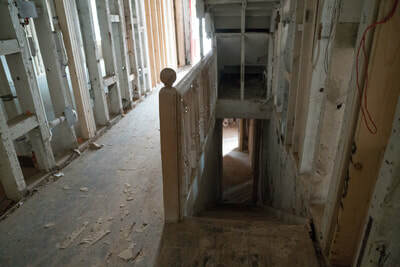 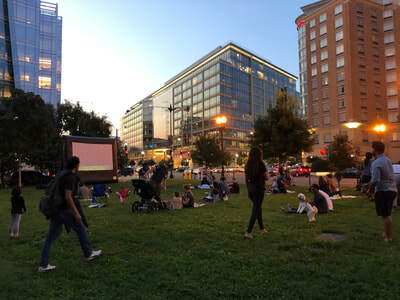 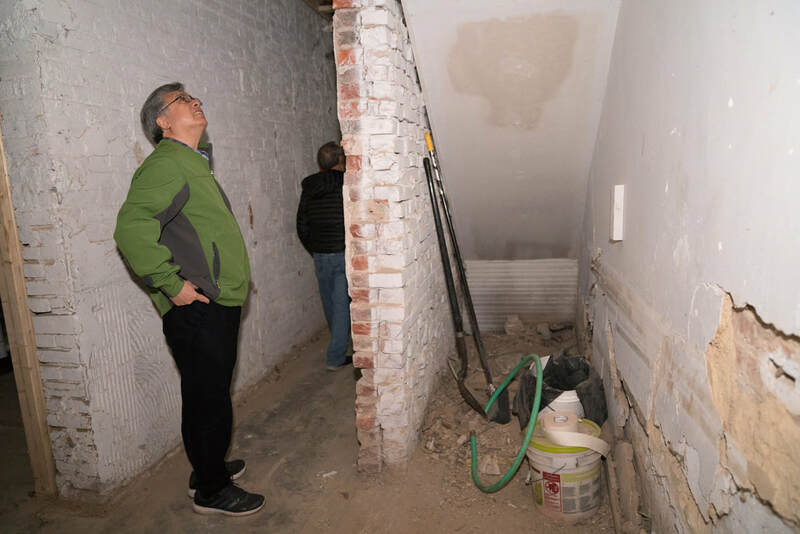 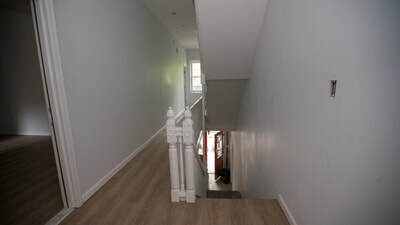 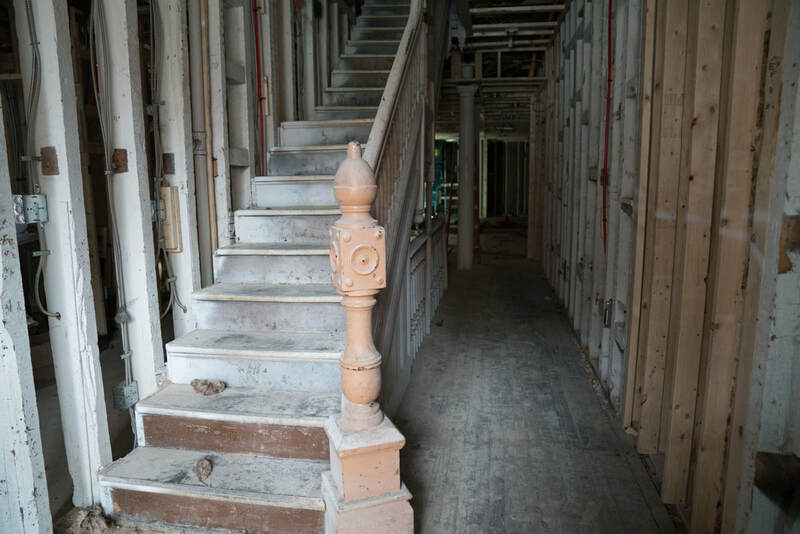 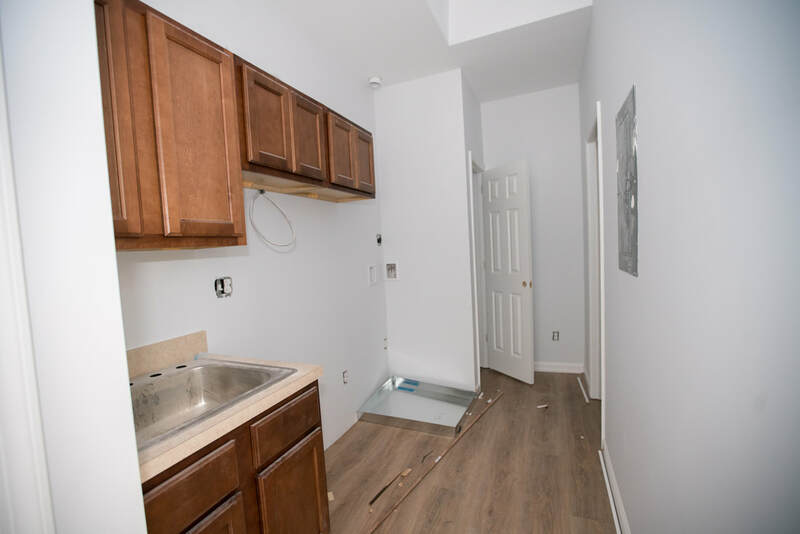 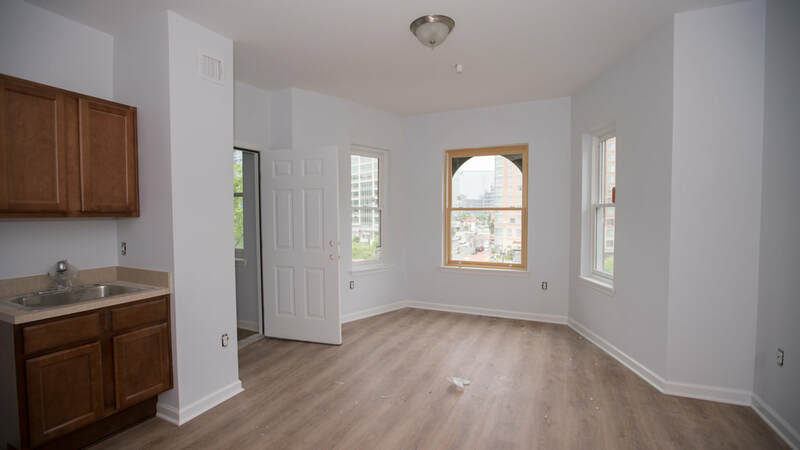 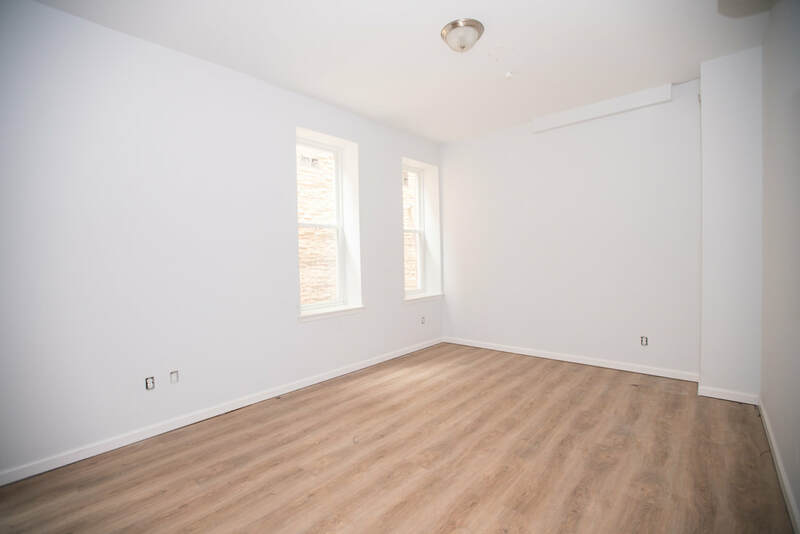 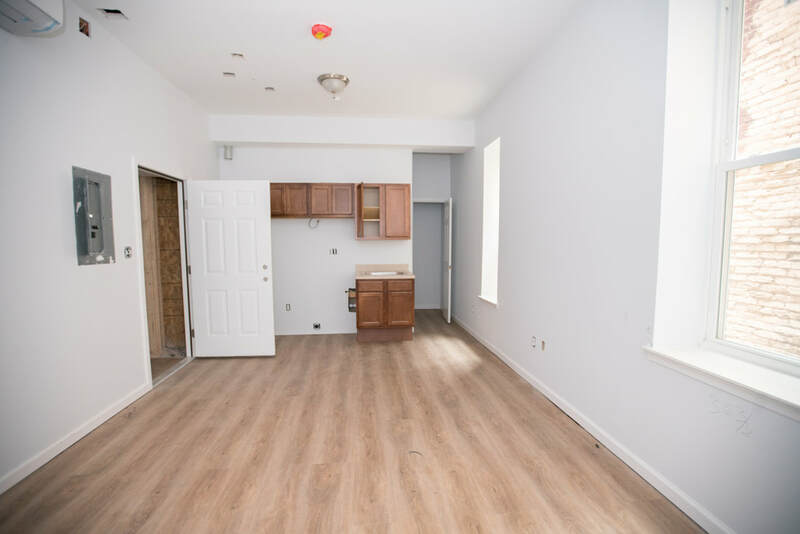 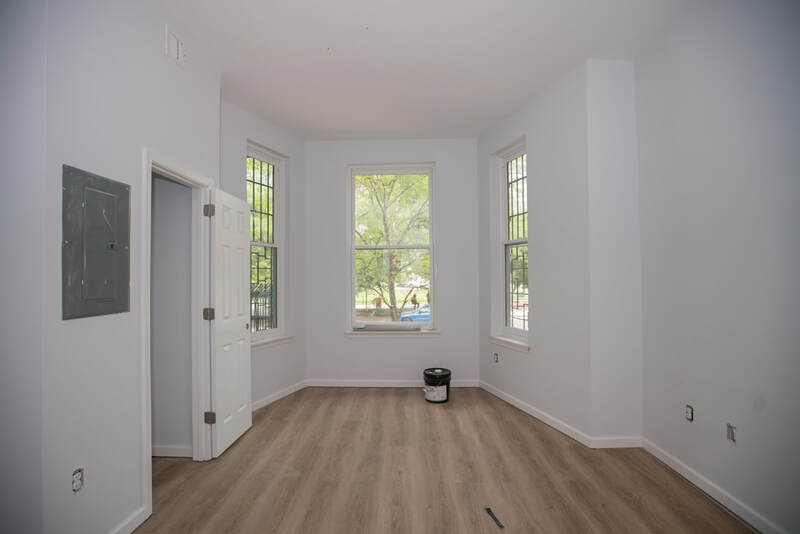 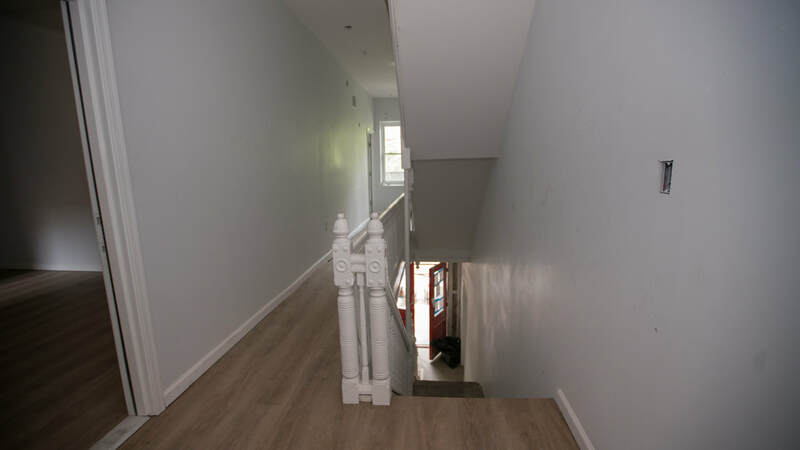 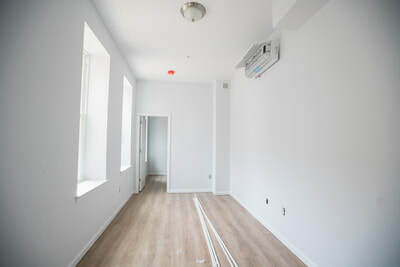 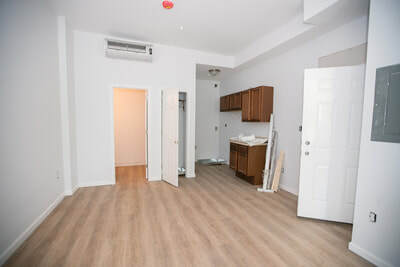 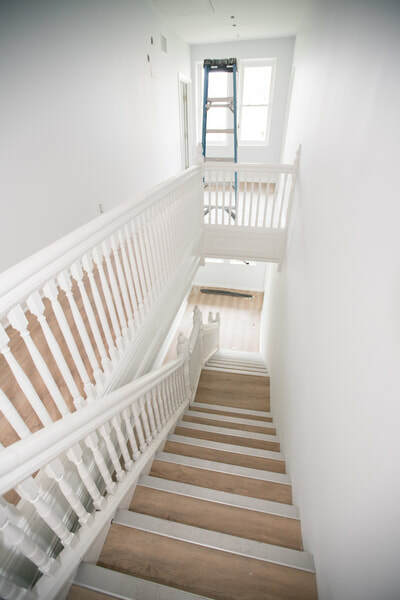 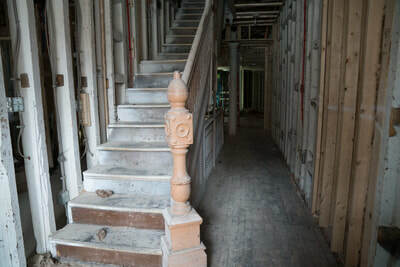 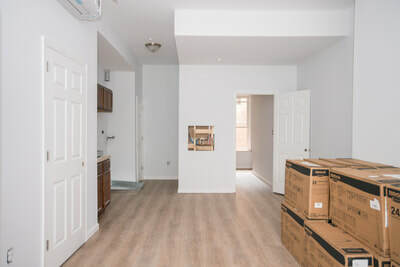 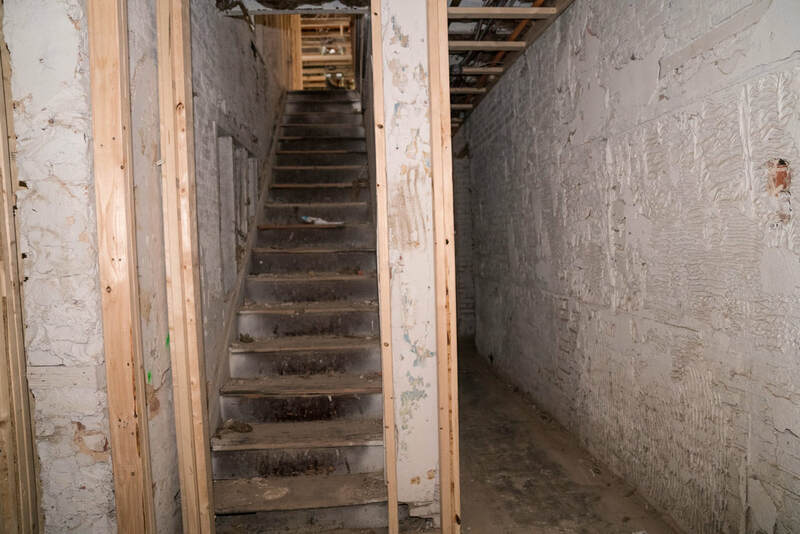 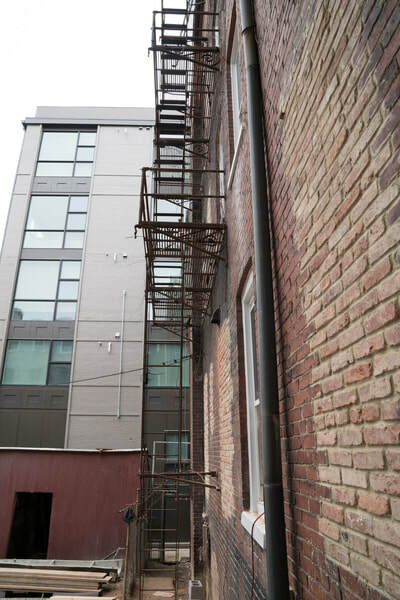 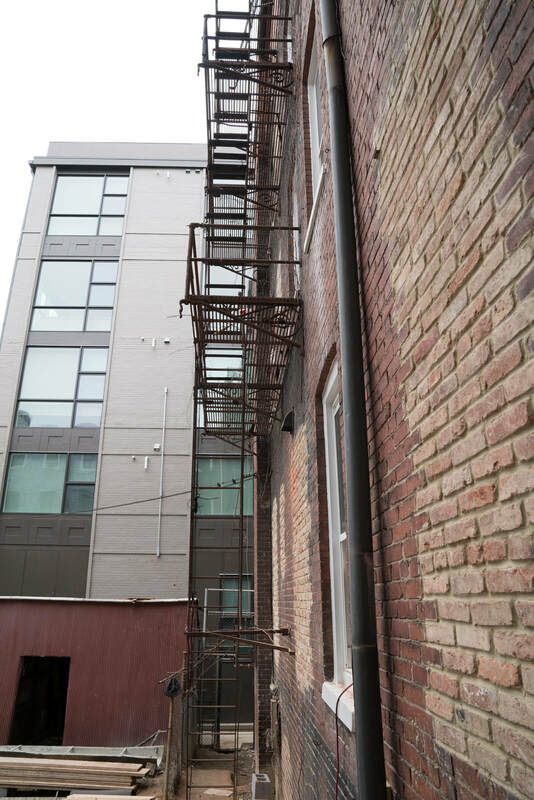 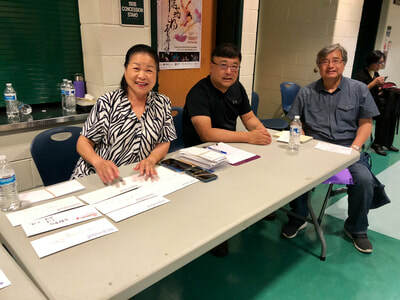 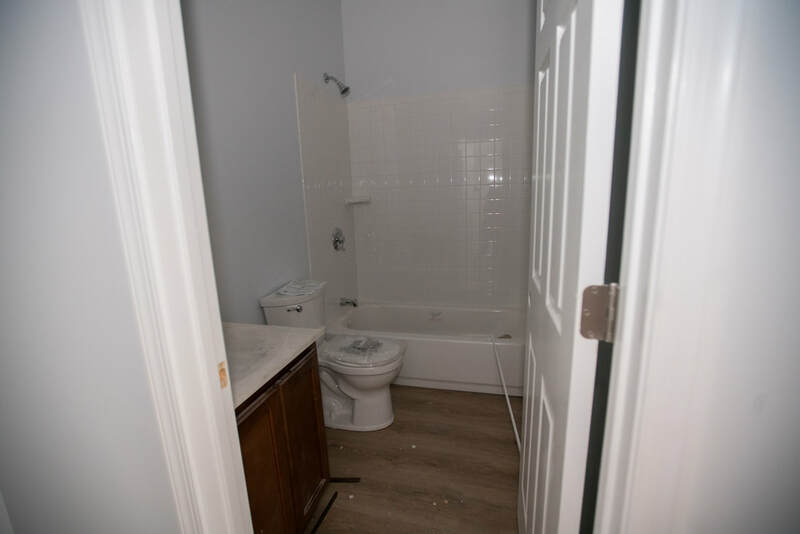 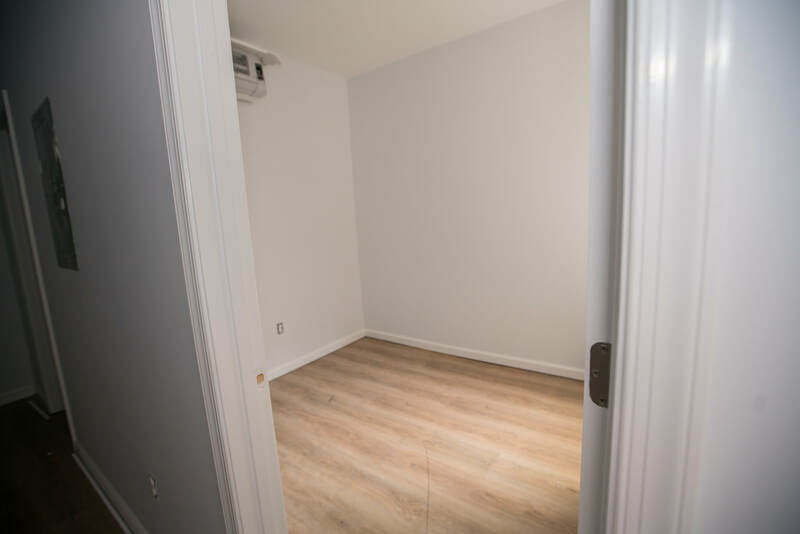 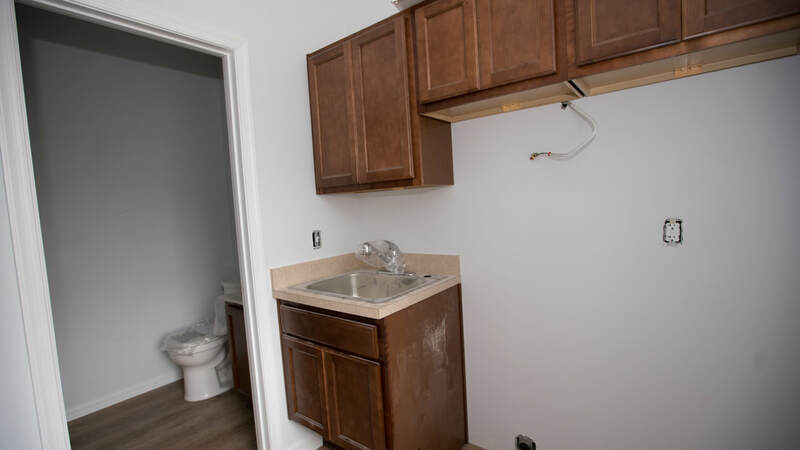 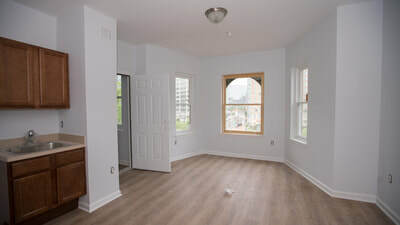 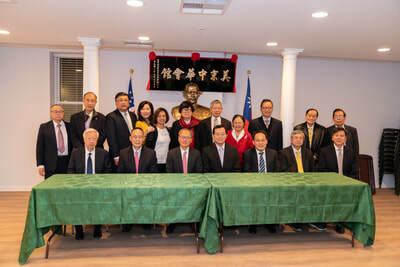 Donated by the Washington Chinatown Development Corporation (WCDC). 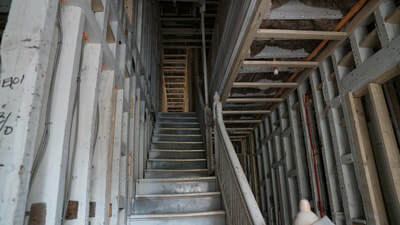 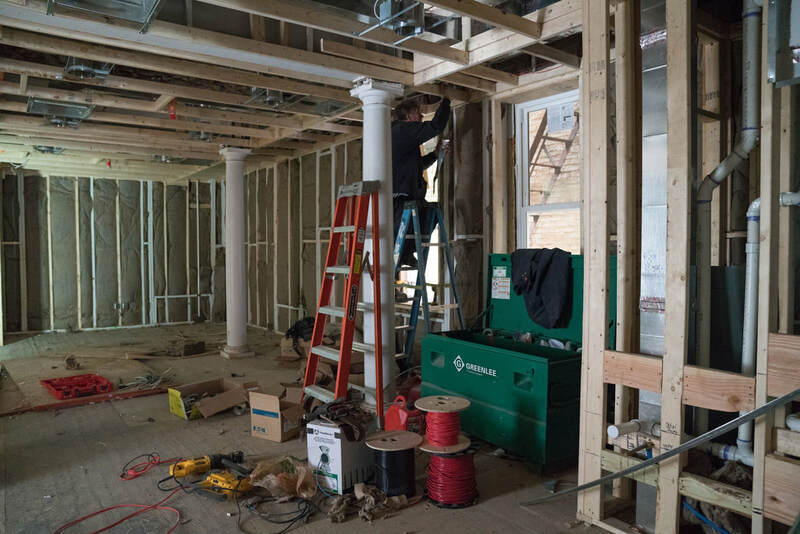 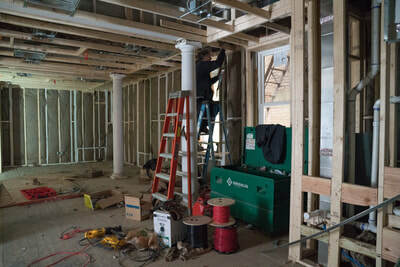 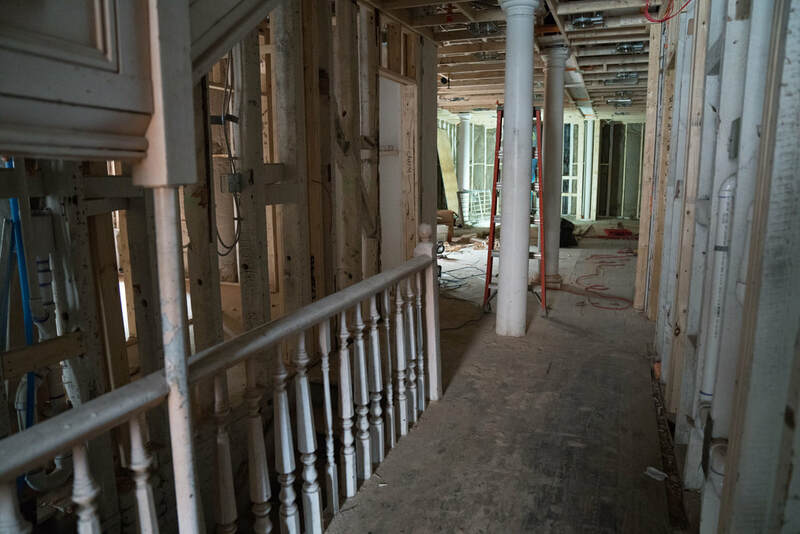 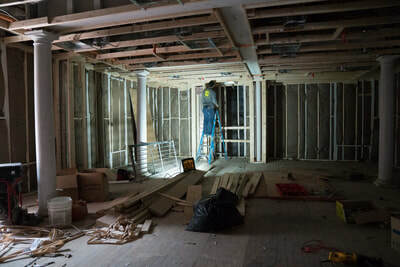 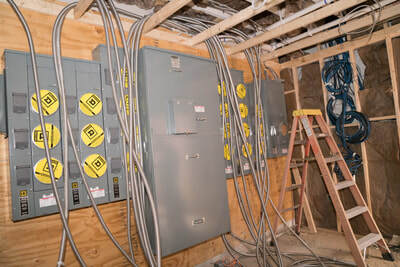 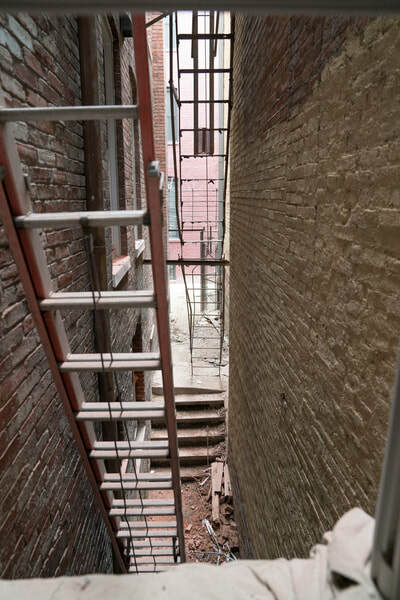 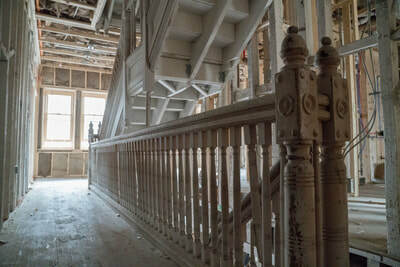 The CCBA building is still under construction and going well. 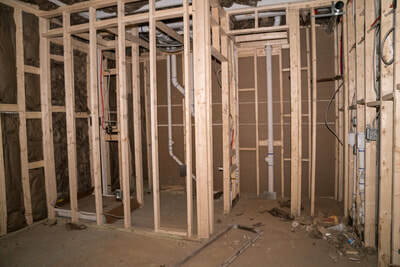 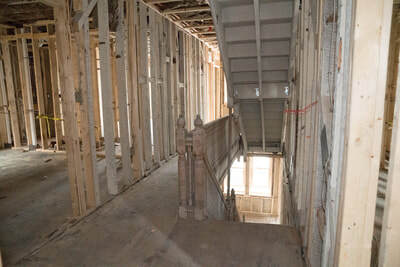 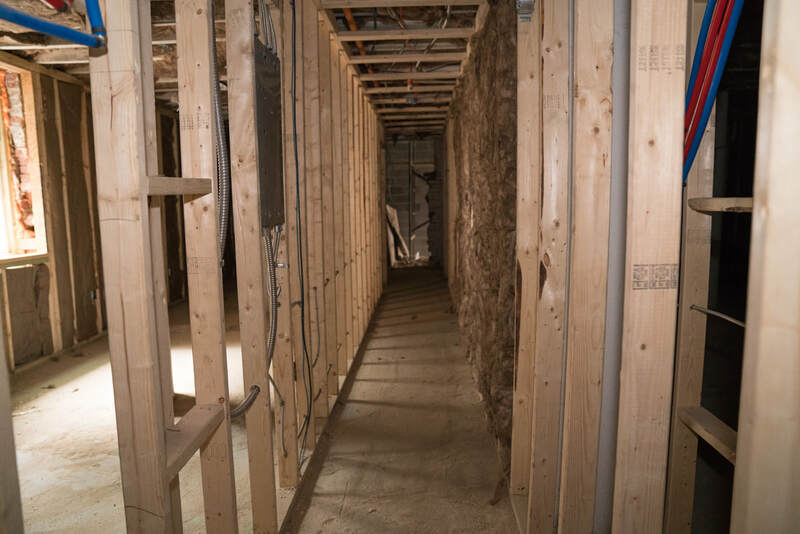 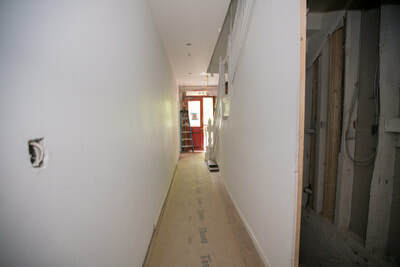 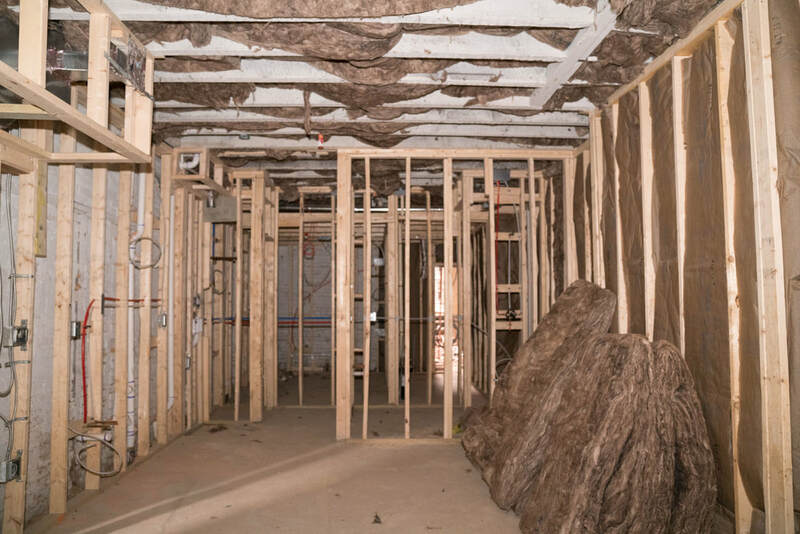 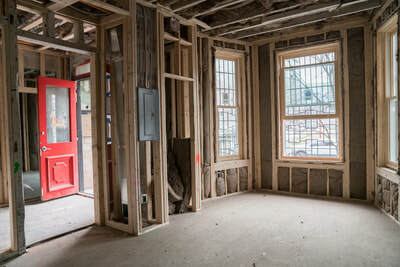 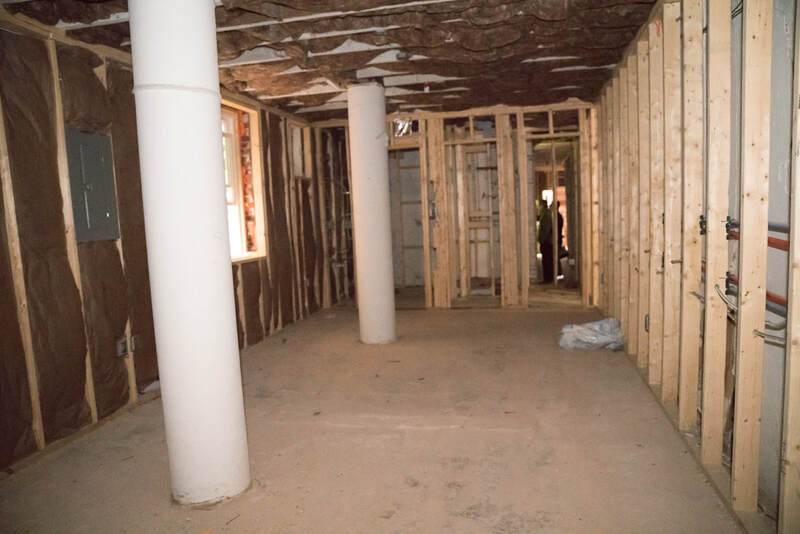 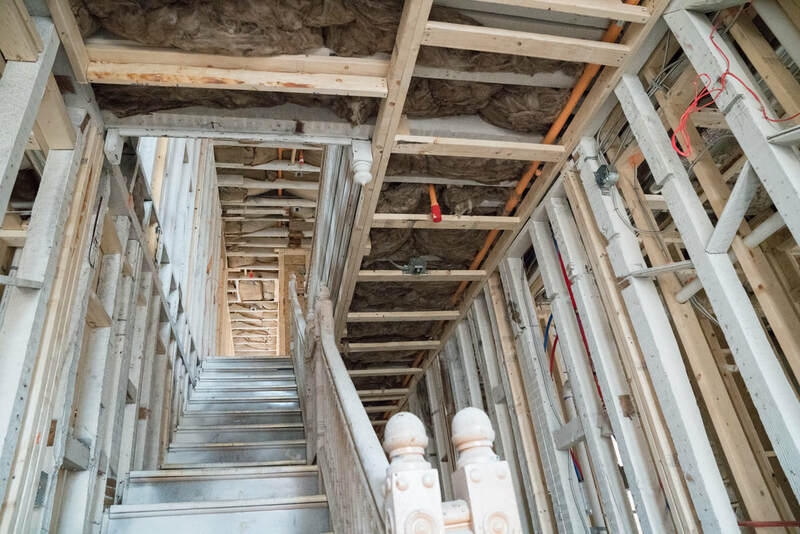 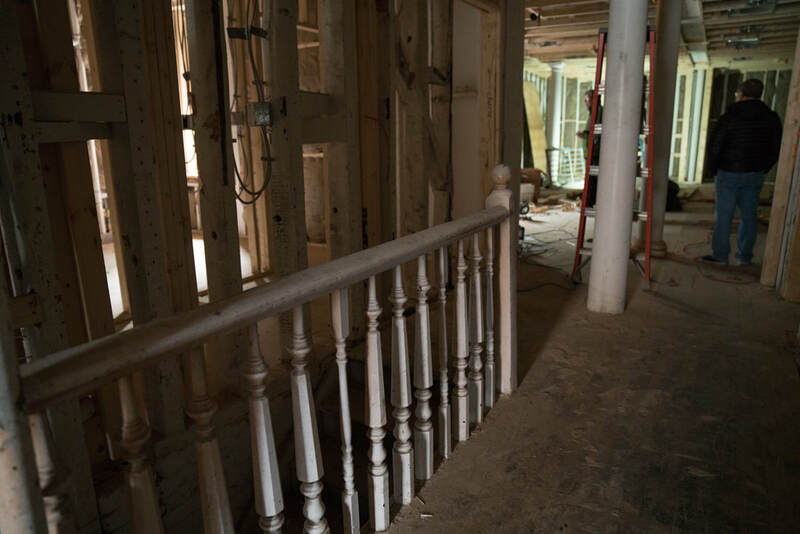 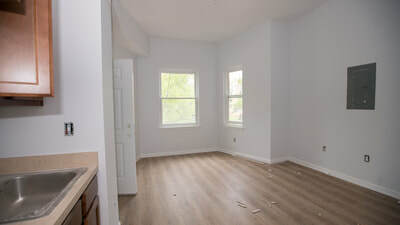 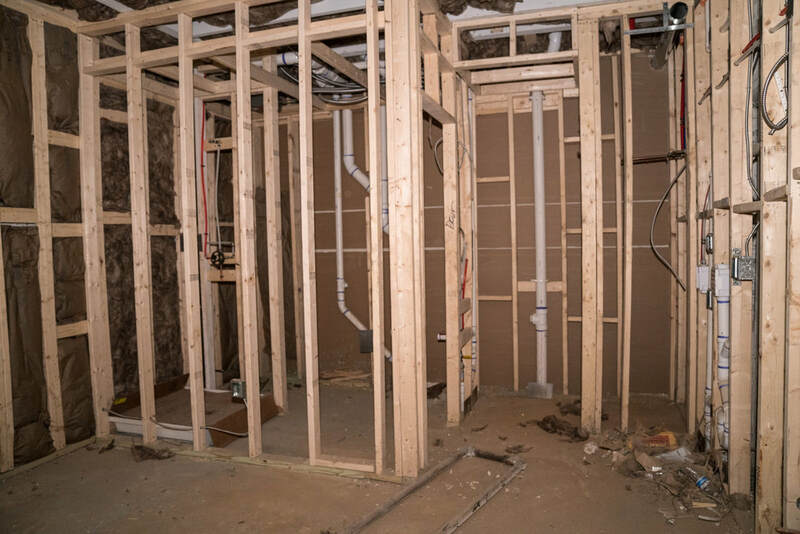 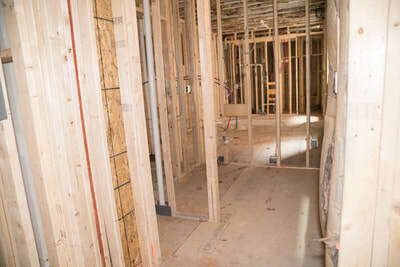 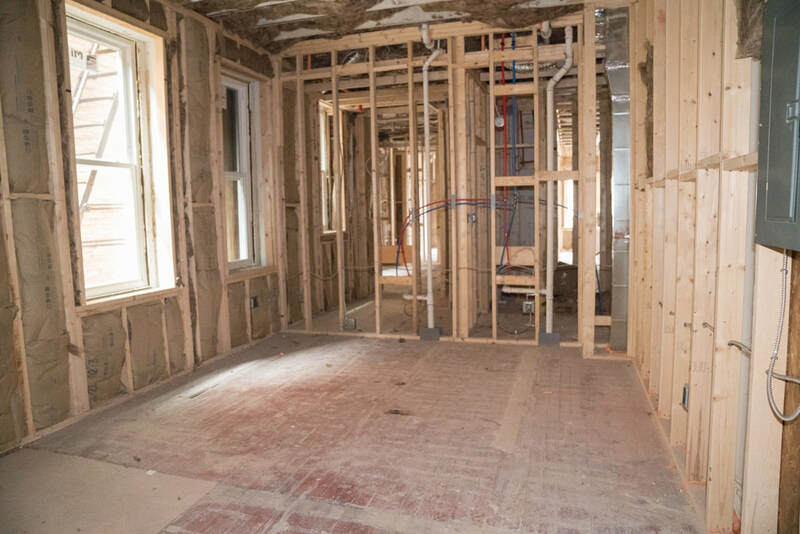 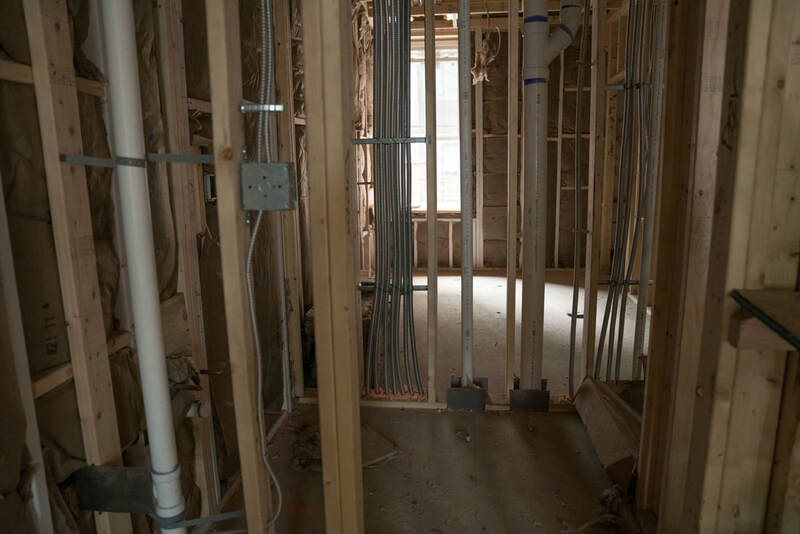 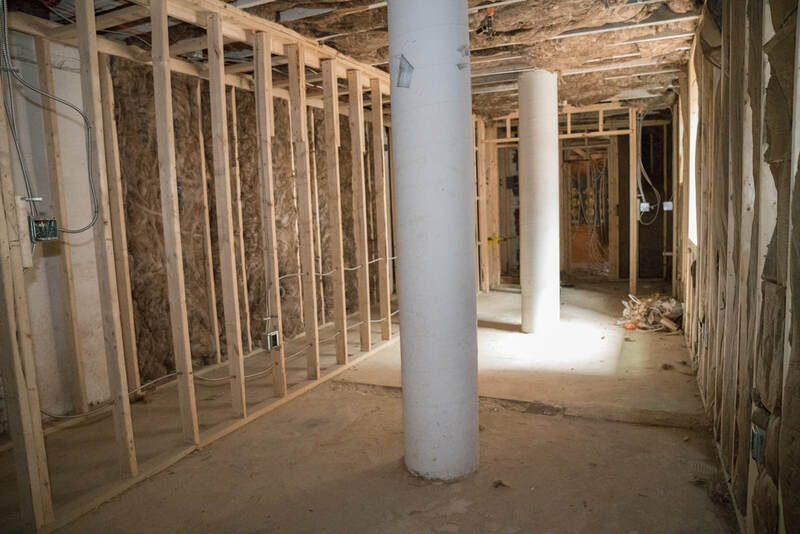 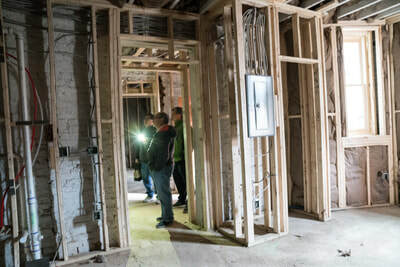 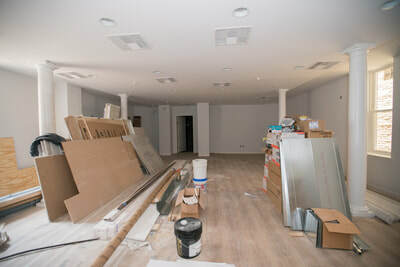 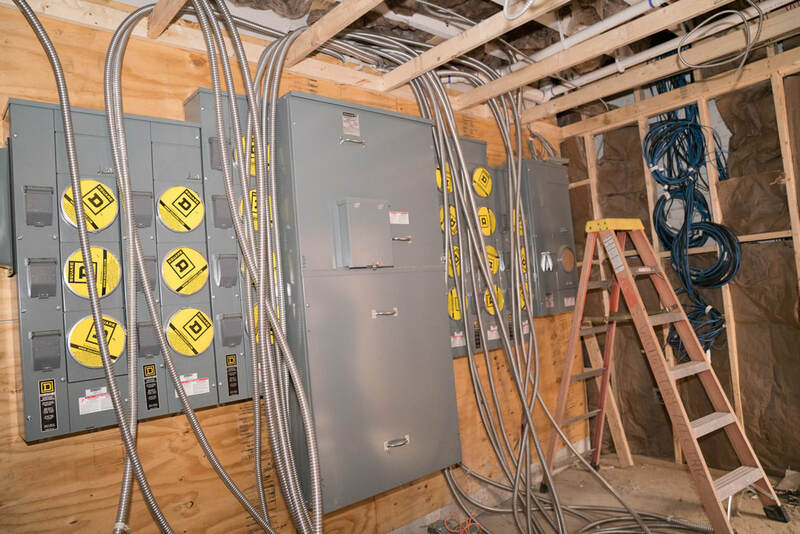 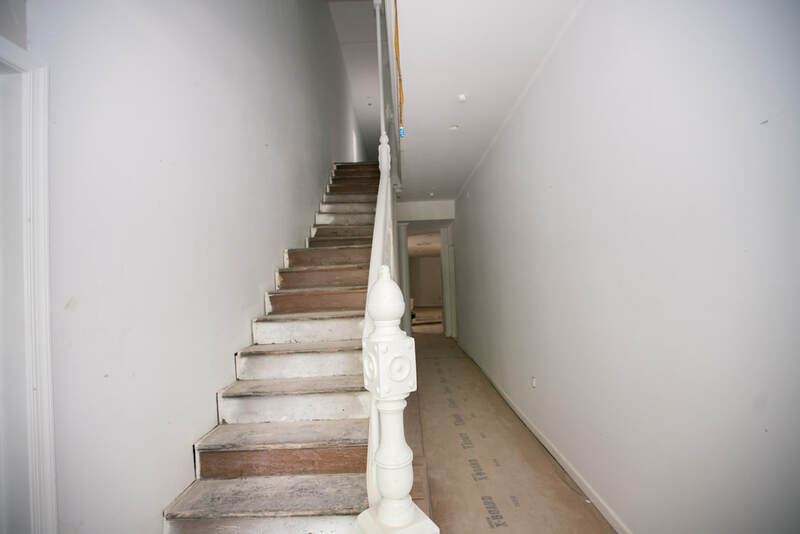 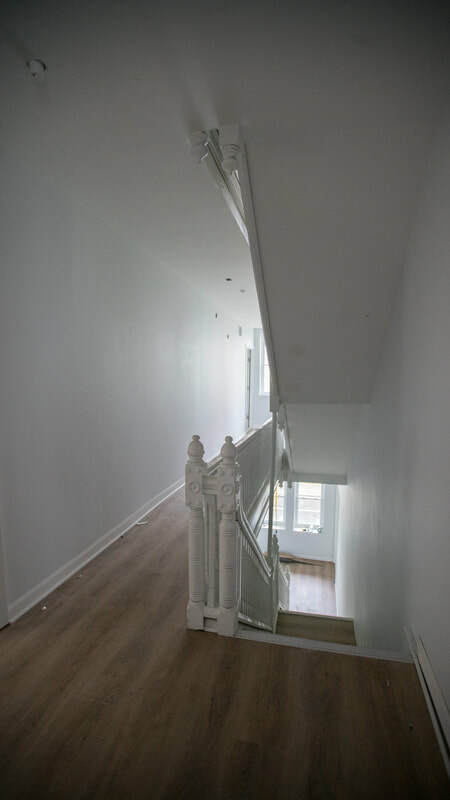 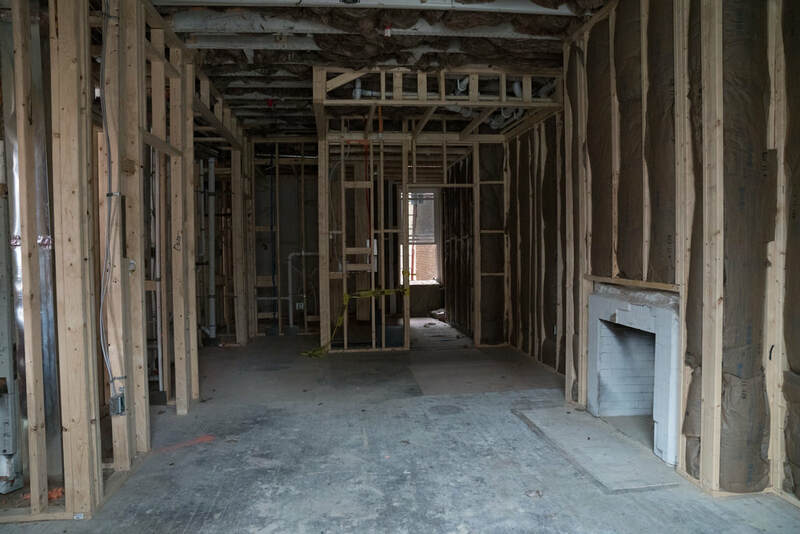 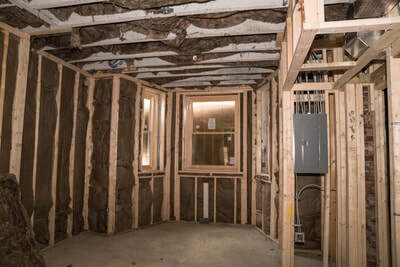 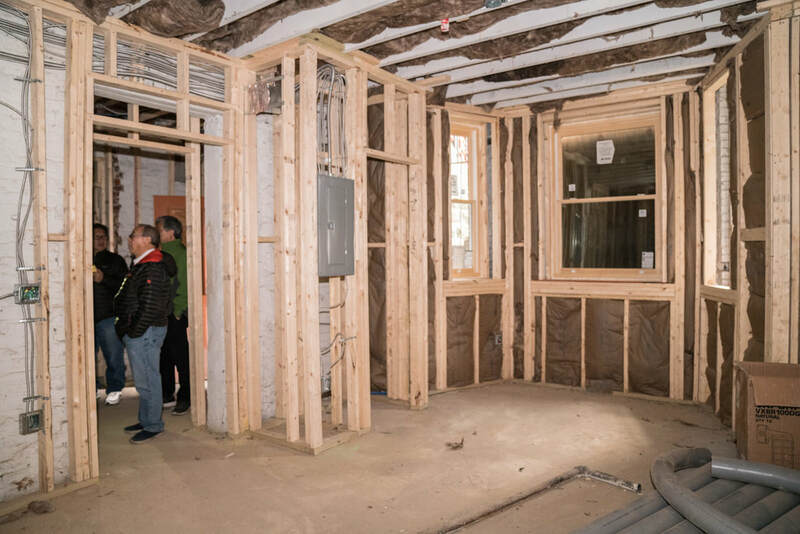 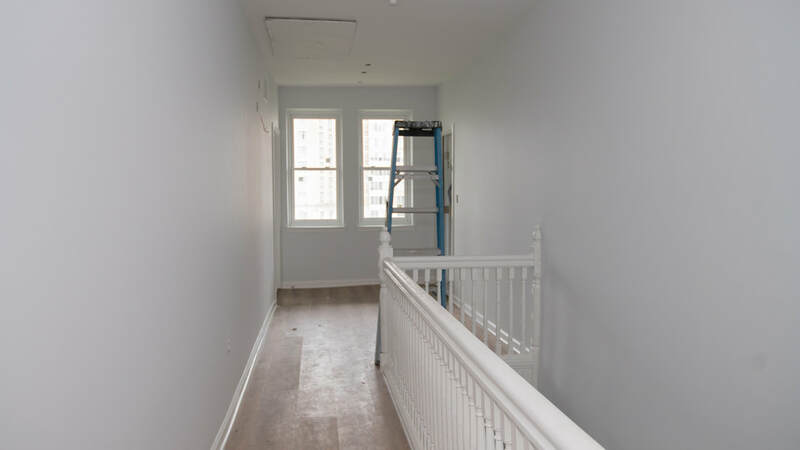 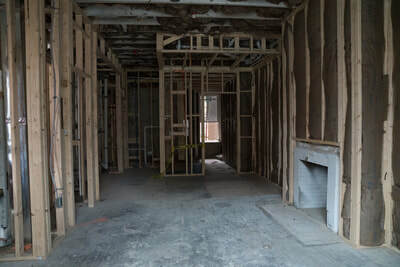 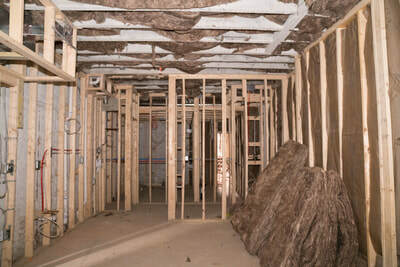 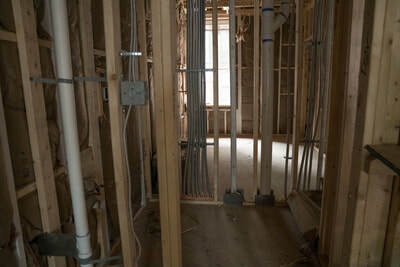 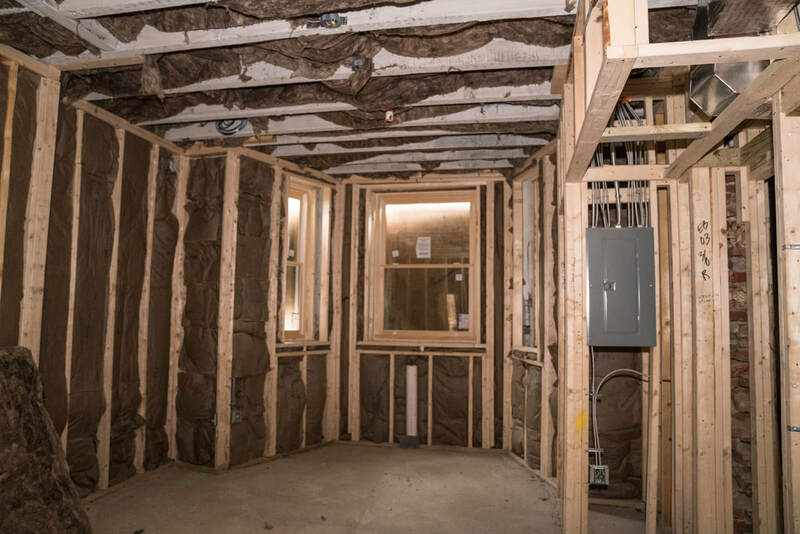 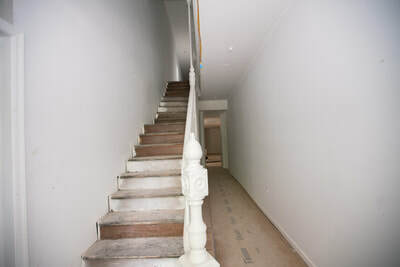 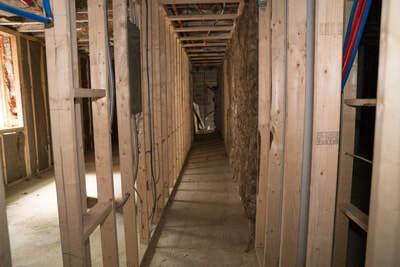 Drywall is up and floors are going in this month. 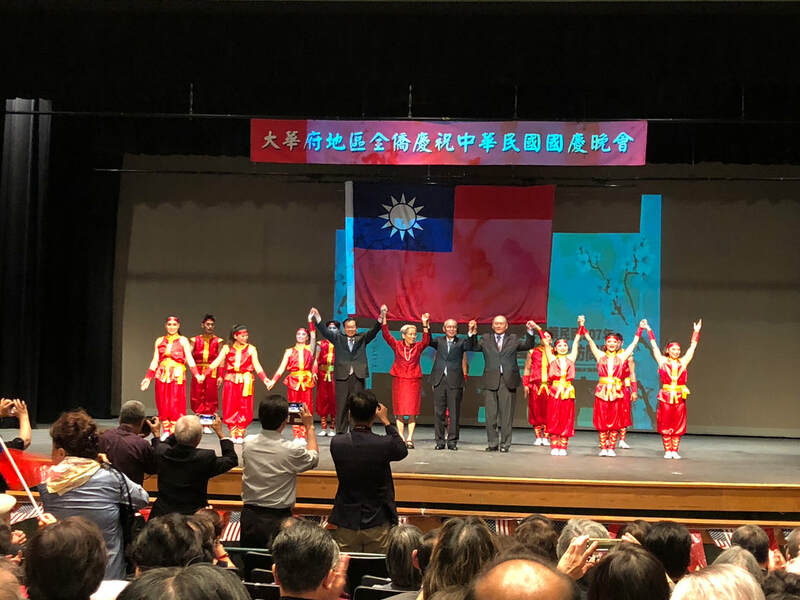 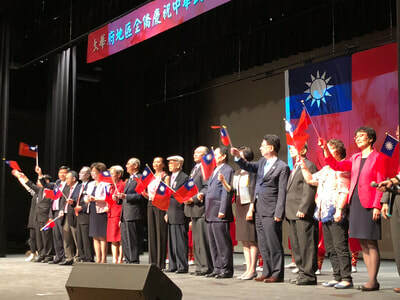 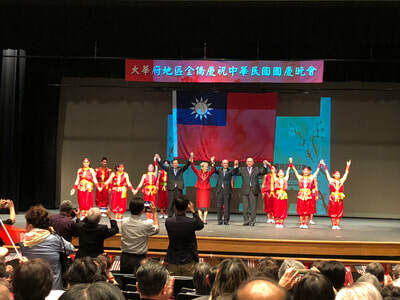 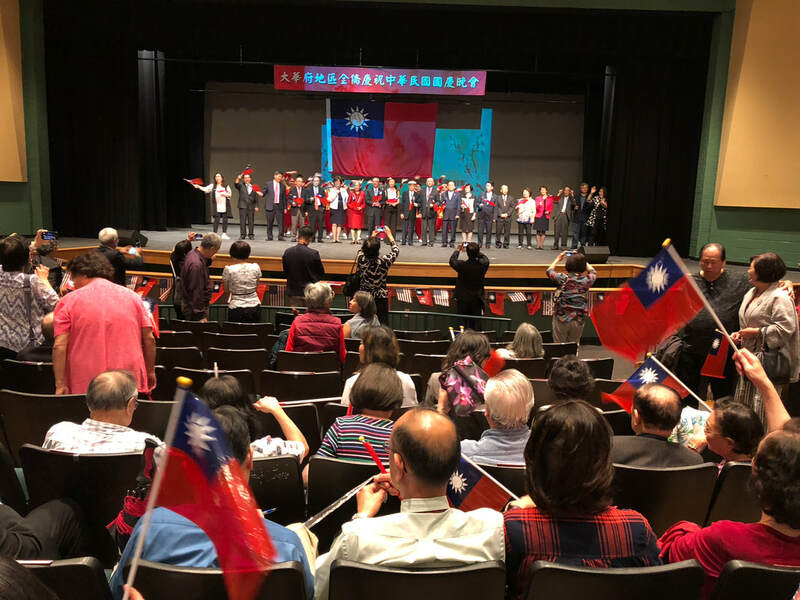 4/24- 4/25 - CCBA delegation traveled to visit the Hualien County in Taiwan on a tour sponsored by the Overseas Community Affairs Council, Republic of China (Taiwan) 僑務委員會. Some places they visited were Hualien Lintienshan Forestry Culture Park 花蓮林田山林業文化園區 , Hualien Tourism Sugar Factory in Guangfu Township 花東縱谷國家風景區, Fataan Wetland Shin-Lui Farm 花東縱谷國家風景區管理處 , Qingshui Cliff (清水斷崖) in Taroko National Park, the Taroko Shakadang Trail & Bridge 太魯閣砂卡噹步道與砂卡噹橋, and Hualien Qixingtan Beach 花蓮七星潭 in Sincheng Township. 4/23/18 - CCBA Delegation traveled to Taipei, Taiwan. 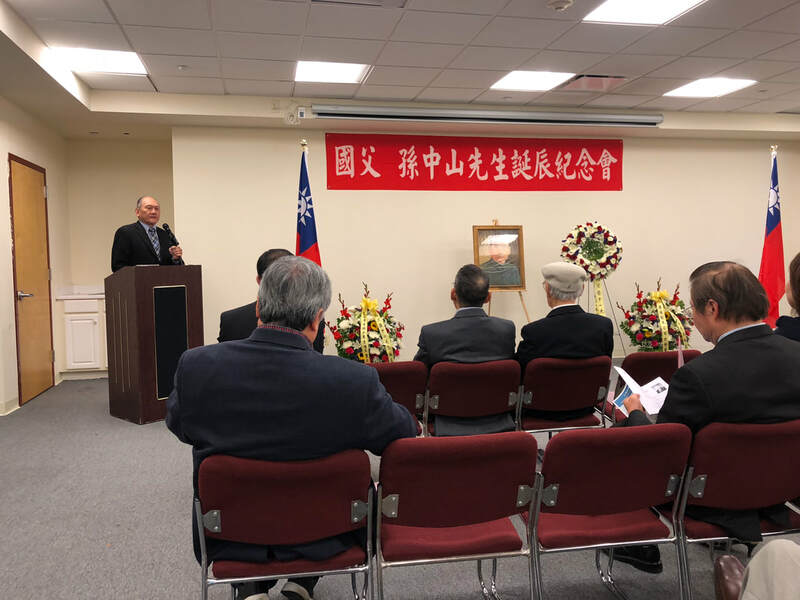 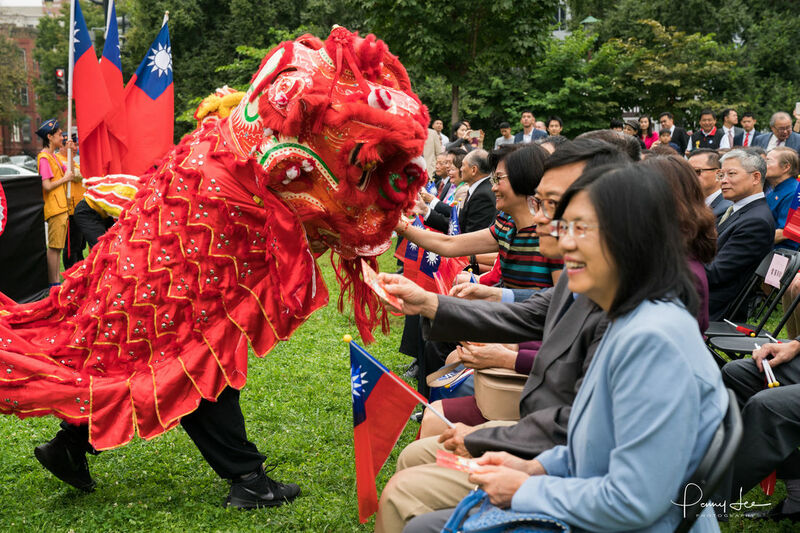 We visited the Overseas Community Affairs Council, toured the Taipei National Palace Museum, and attended a reception at the Ministry of Foreign Affairs, Republic of China (Taiwan). We were welcomed with gracious hospitality and friendship by the Taiwan Officials and Representatives. 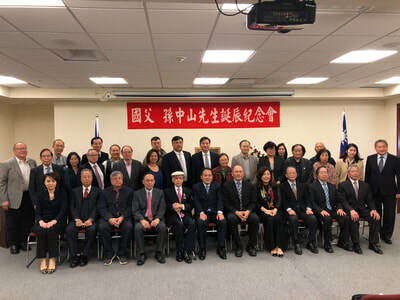 CCBA Chairman Wallace Lee led the DC CCBA delegation to pay a visit to the Overseas Chinese Affairs Committee in Taipei. 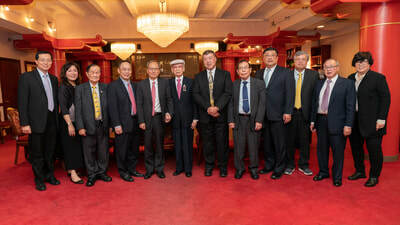 Lu Yuan Rong met the delegation members at the Overseas Chinese Affairs Commission Headquarters. We also visited the Ministry of Foreign Affairs, Republic of China. A special dinner was prepared and was hosted by OCAC. Later a tour to the National Palace Museum was arranged and for the next three days, arranged trips to sightseeing in Hualien, Taiwan. 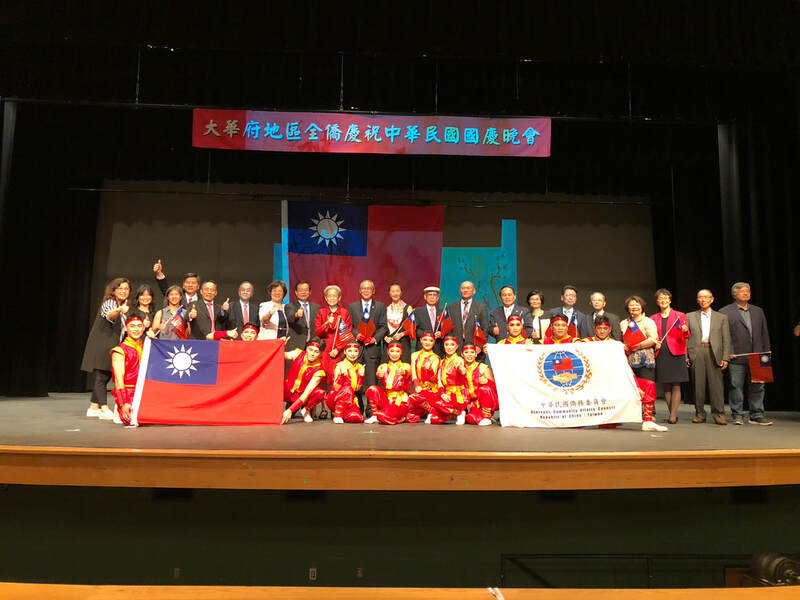 4/24/18 - Overseas Chinese Affairs Committee (OCAC) arranged sightseeing trip to visit Hualien, Taiwan. 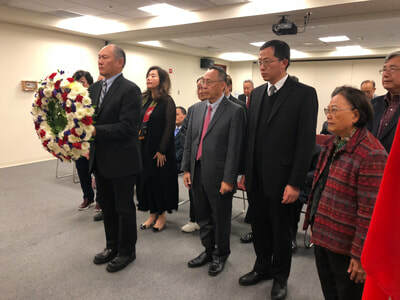 Qingming, also known as Tomb-Sweeping Day in English, is an annual Chinese traditional festival where they remember and honor their ancestors by visiting the graves and burial grounds to pay their respects. 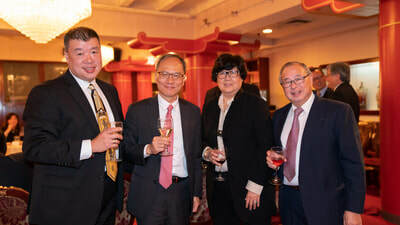 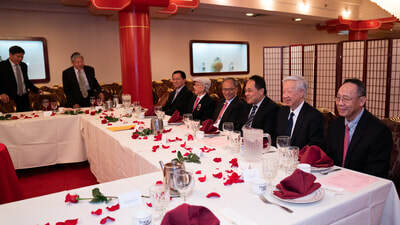 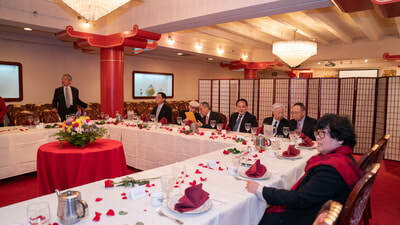 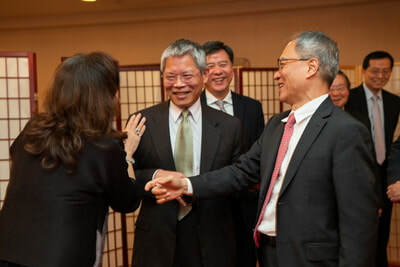 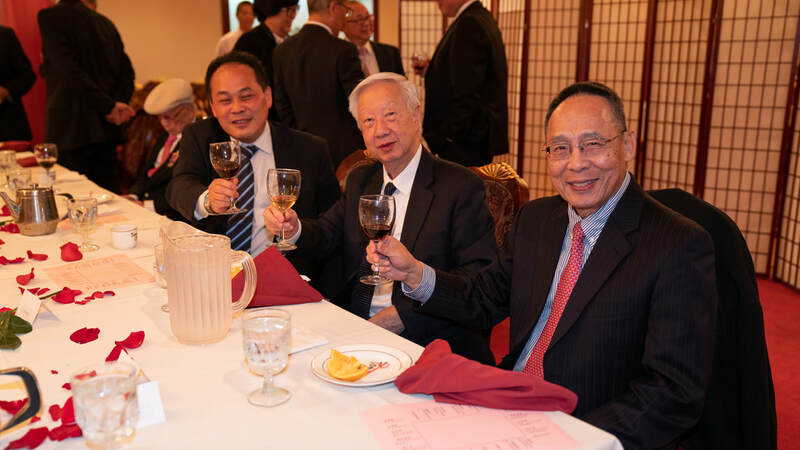 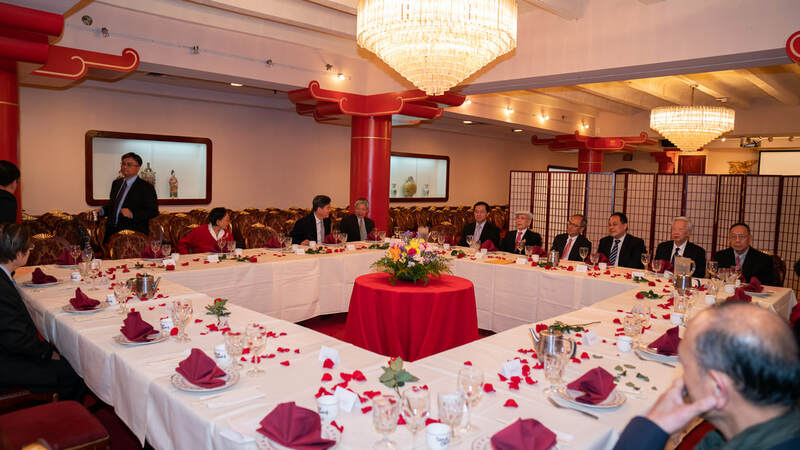 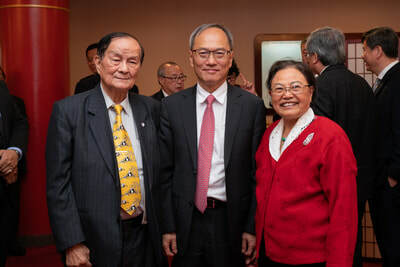 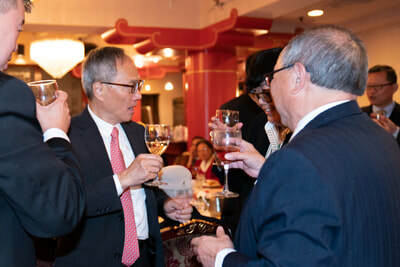 In March, as we continue to celebrate the Lunar Chinese New Year, CCBA attended many Spring banquets. 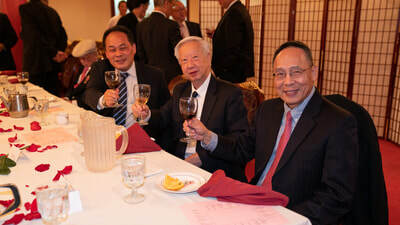 ​April 7th - Moy's Association Banquet. 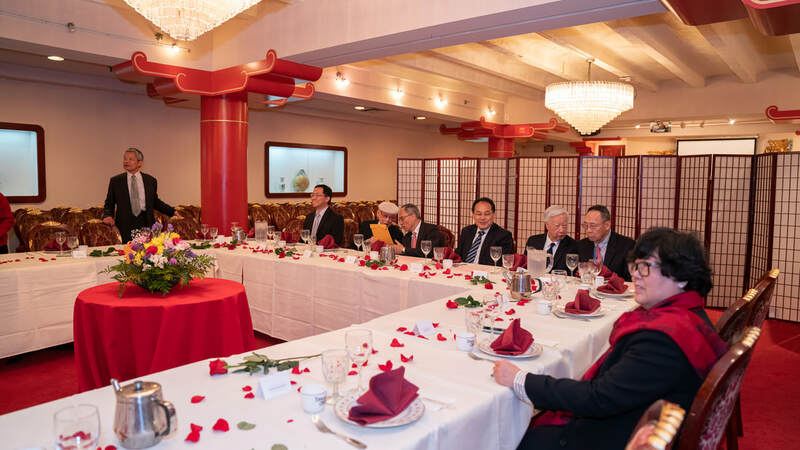 On Sunday, February 25, 2018, WCDC hosted a Chinese New Year dinner celebration at the Wah Luck House for its residents. The food was provided by Chinatown Gardens Restaurant. 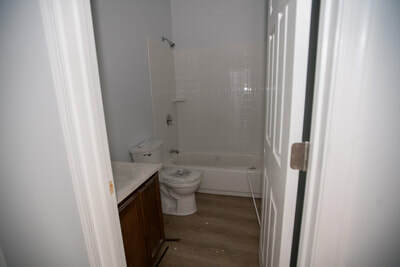 It was delivered and setup by their staff. 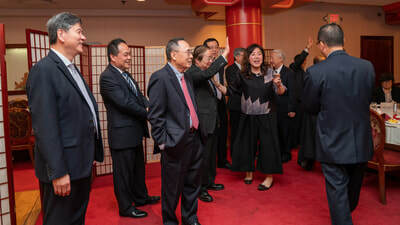 WCDC President Rita Lee gave Red envelope (hung baos) to the residents and everyone was very happy! Gung Hay Fat Chor! 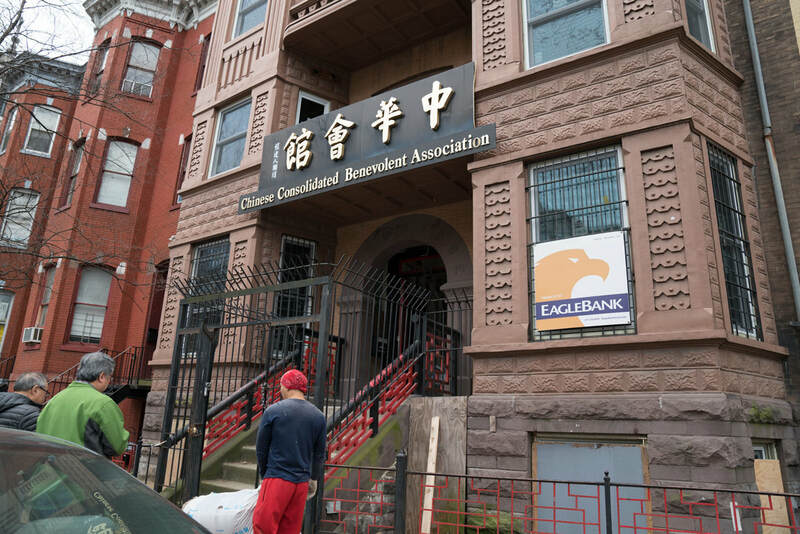 On Sunday, February 18, 2018, CCBA sponsored the Annual Chinese New Year Parade in Washington, DC Chinatown. 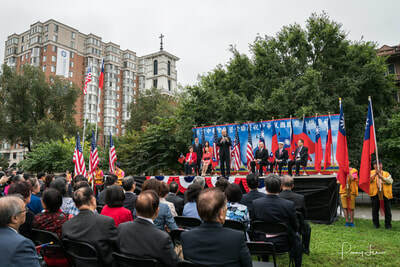 The weather was beautiful and we had the biggest crowd ever! 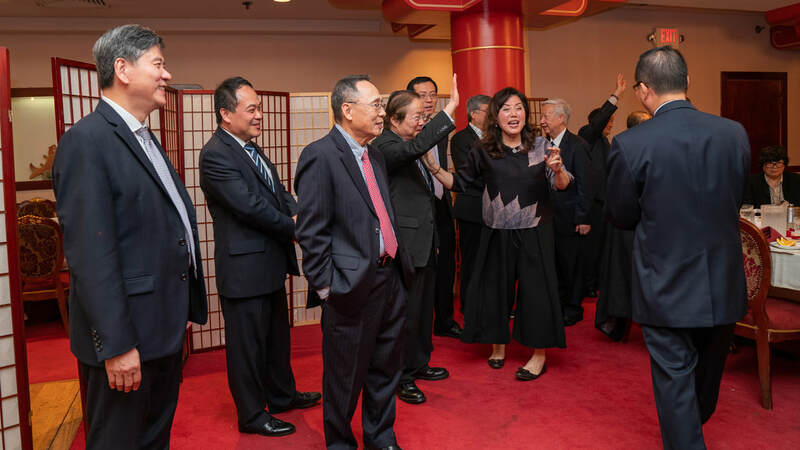 On Feb. 15, 2018, Members of CCBA attended the welcoming of the Chinese New Year on the Eve of the Lunar calendar with a lion dance to cast out the old and bring in the new year with a bang! 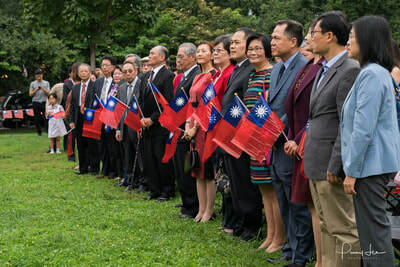 VIPs from TECRO also attended the celebrations. 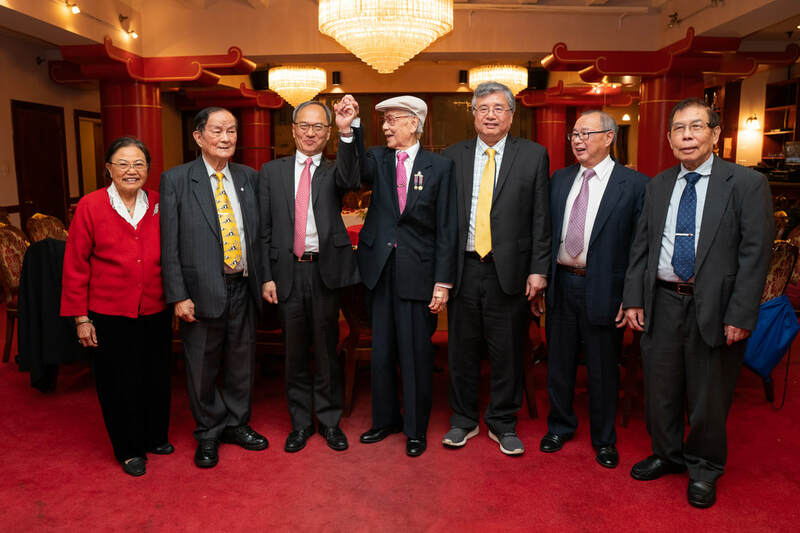 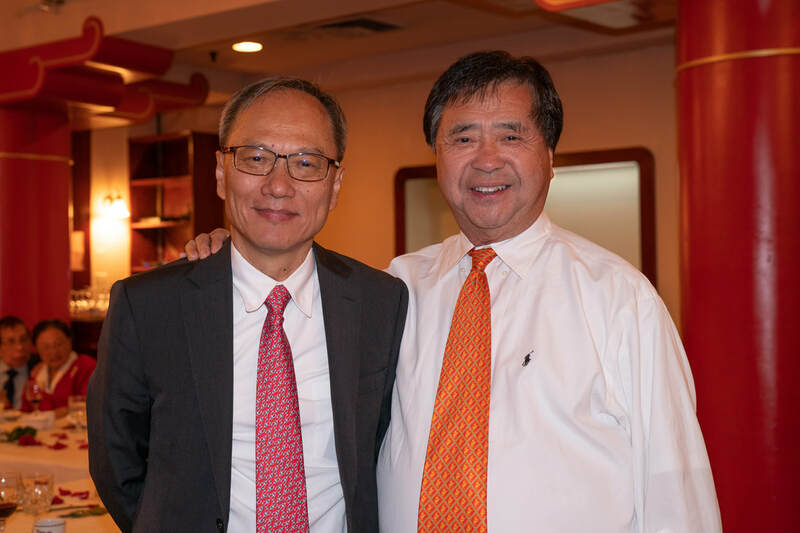 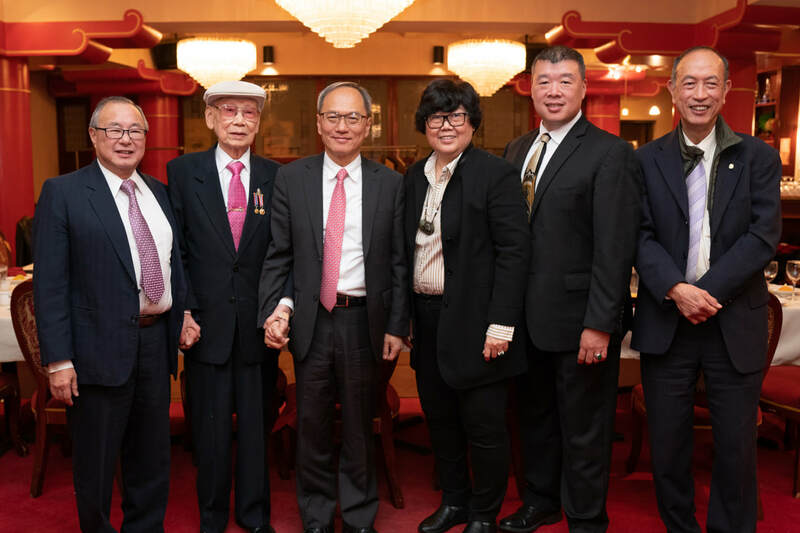 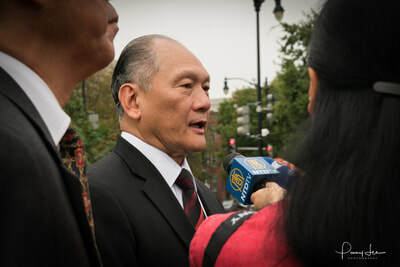 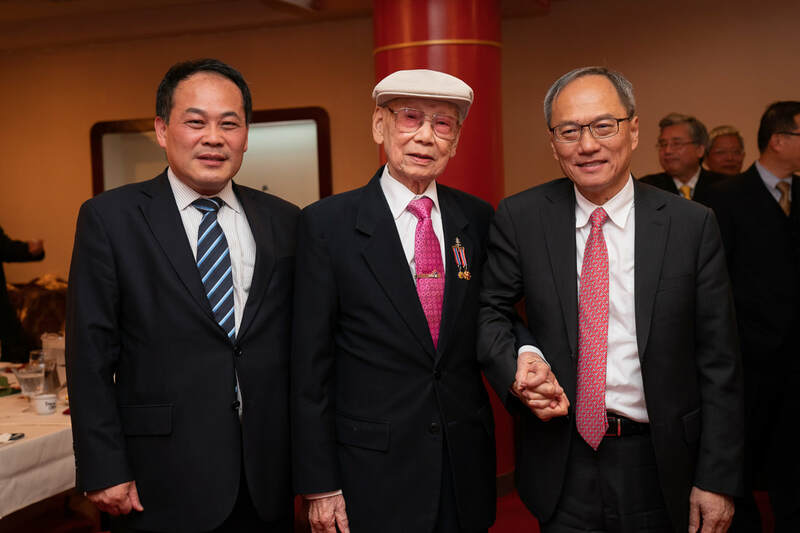 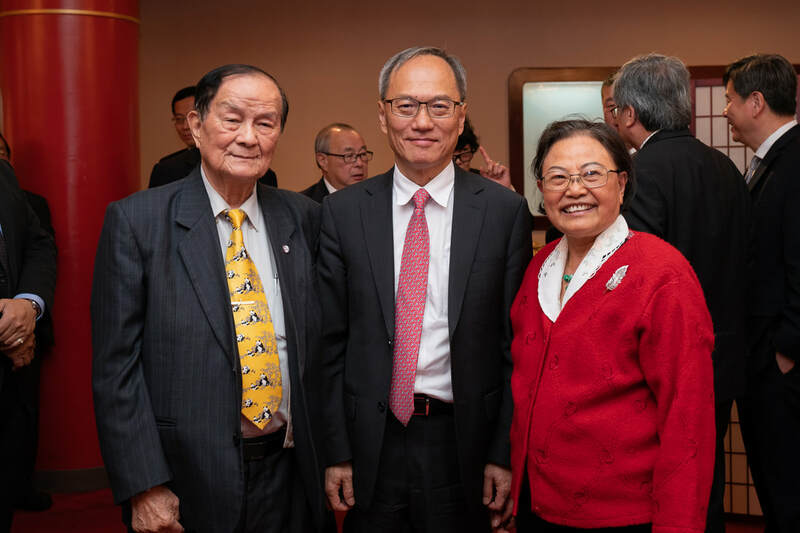 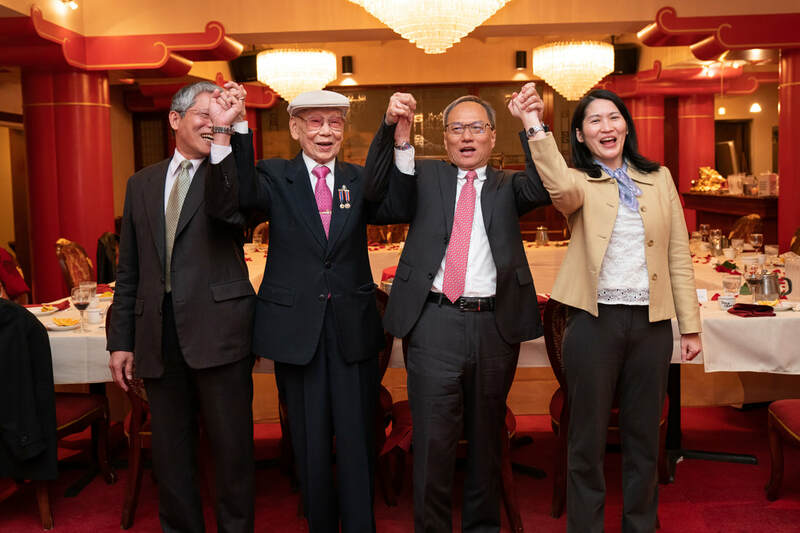 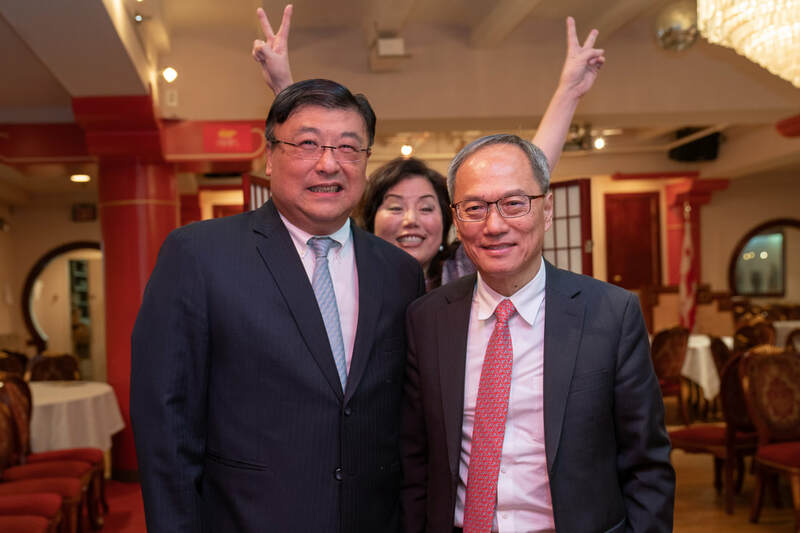 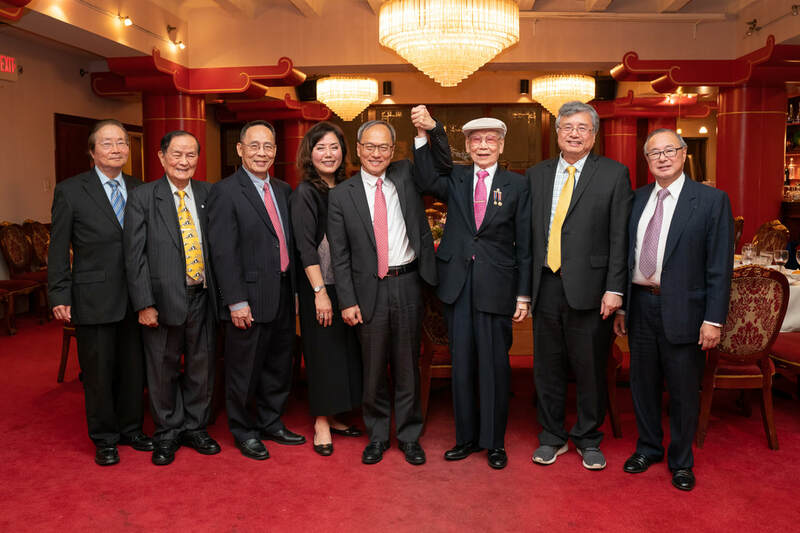 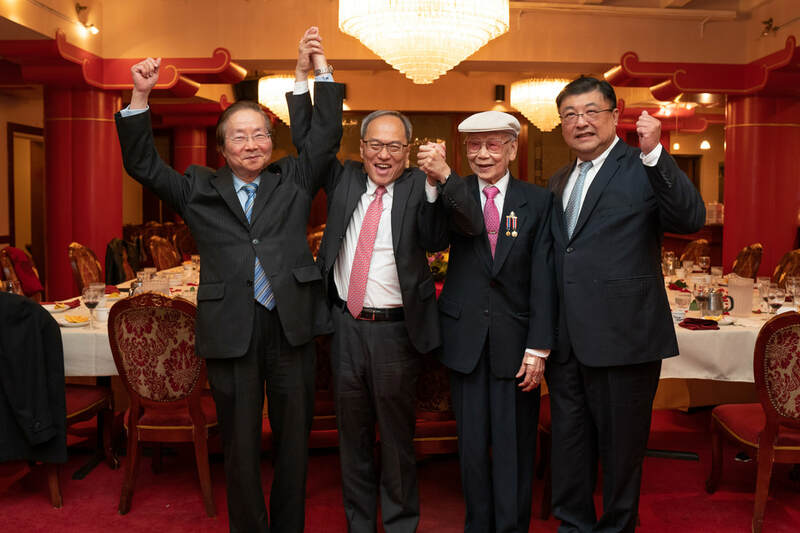 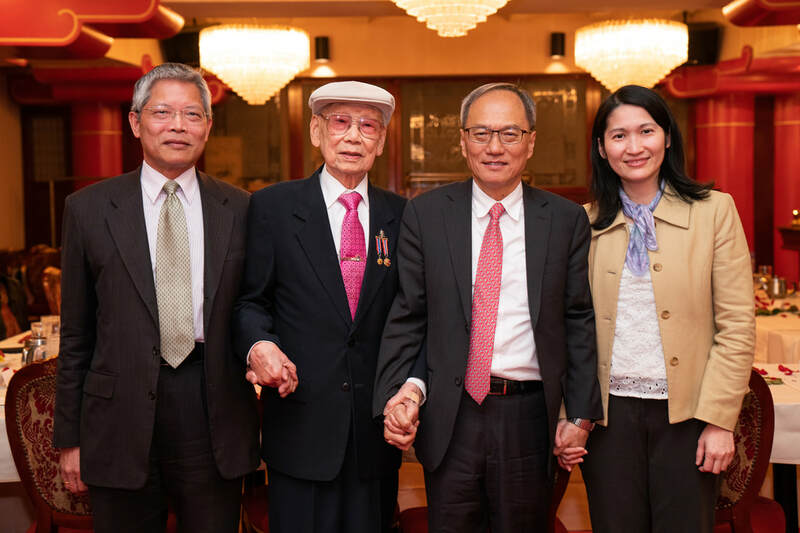 On Feb. 11, 2018, CCBA invited the local media, newspaper reporters, parade participants and parade sponsors to a press conference at Tony Cheng’s Restaurant in Washington, DC. 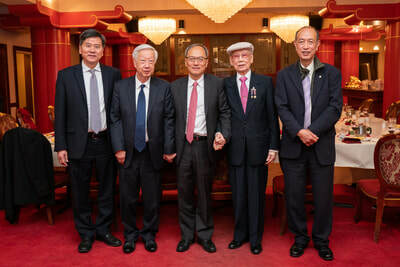 Members on the panel included Wallace Lee (CCBA Chairman), Sui Chan (CCBA Vice Chairman), Rita Lee (CNY Chief Commander), Dr. Hon Yuen Wong (CNY Chief Commander), Wai Man Lee (CNY Chief Commander), Thomas Fong (CNY Parade Commander/Marshall) and Penny Lee (CNY Photographer/Media). 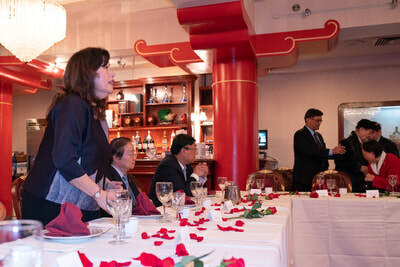 VIP guests included: Richard Chuang-General Manager of Maryland LIVE Casino, David Chalker - Vice President of TD Bank, Jeffrey Hol - President of Almas Shriners, Judy Go Wong - Director of Asian Pacific American Films, and Brianna Kinsey - Miss Washington, DC. 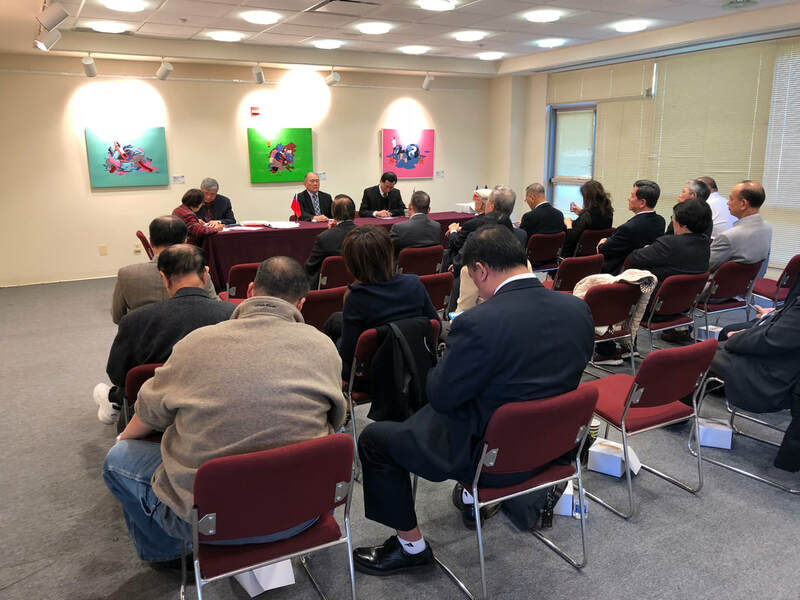 2/4/18 & 2/11/18 - CCBA Meeting in DC Chinatown​ to confirm plans for the upcoming Chinese New Year Parade. 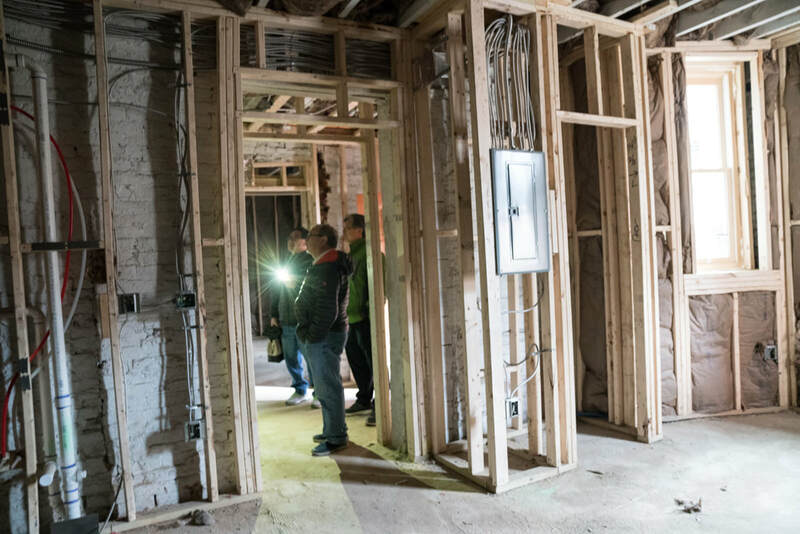 ​CCBA had weekly meetings at the Wah Luck House to discuss the planning of the upcoming Chinese New Year parade. Chairman Wallace Chan-Man Lee presided over the meetings. 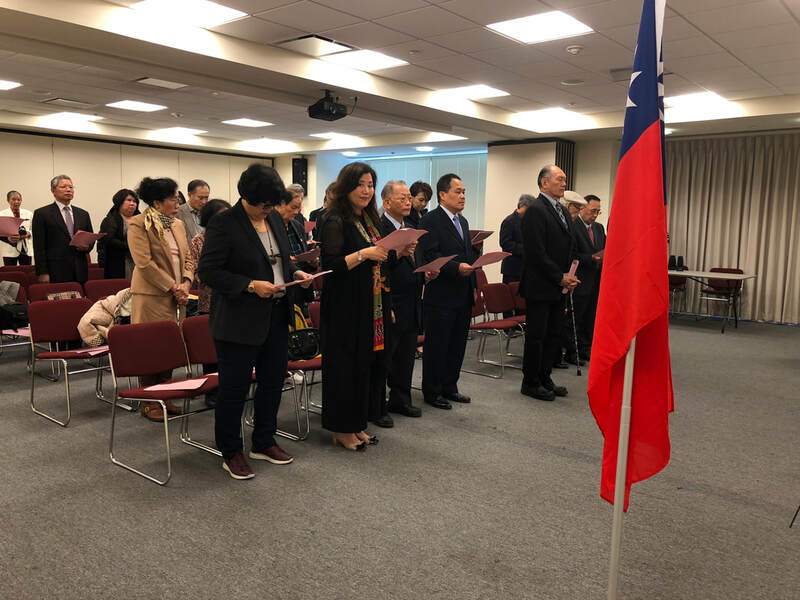 On this day 2/4/18, the Director of TECRO Consular Division, Mr. Daniel Chou, attended to say a few words and introduce himself to the CCBA members. 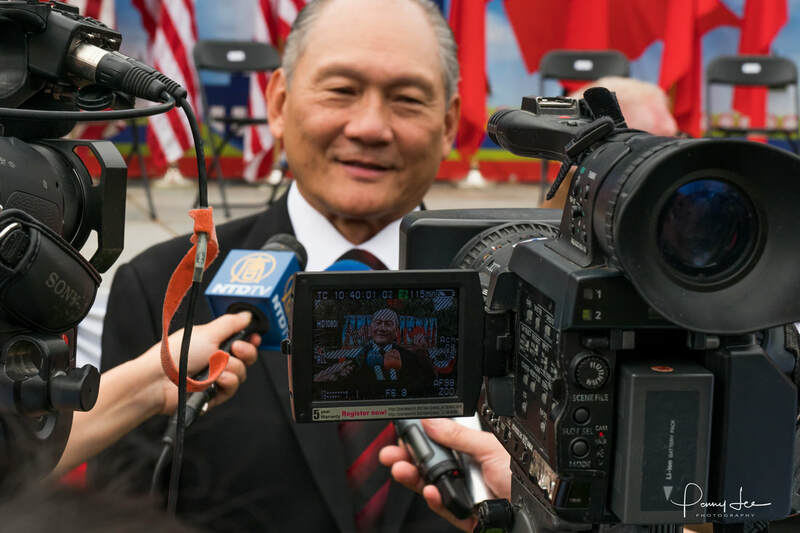 Tom Fong, CCBA Chinese New Year Parade Marshall was in attendance to update us on the latest participants and procedures for the event. 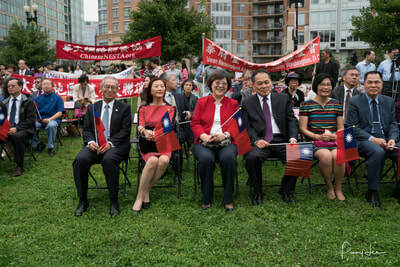 Dr. Hon Yuen Wong was also present to vibe his input regarding the parade. 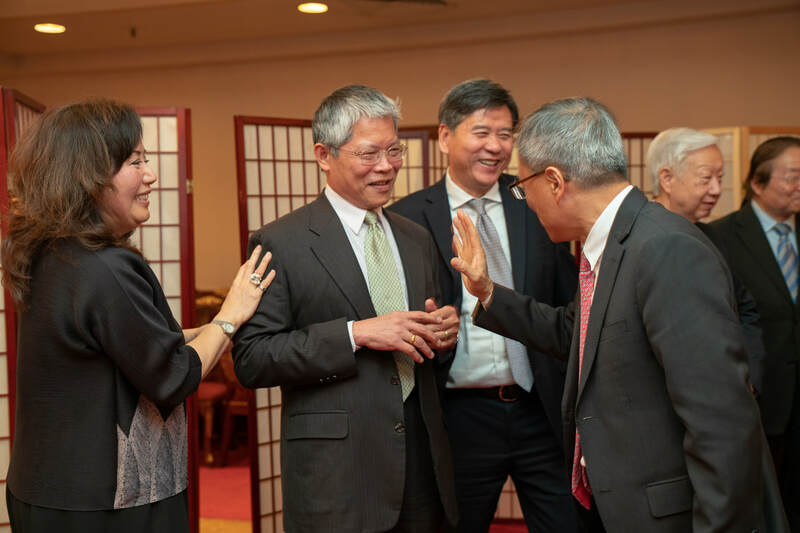 1/1/18 - Wallace Lee is sworn in as CCBA Chairman in a ceremony, in Washington, D.C. 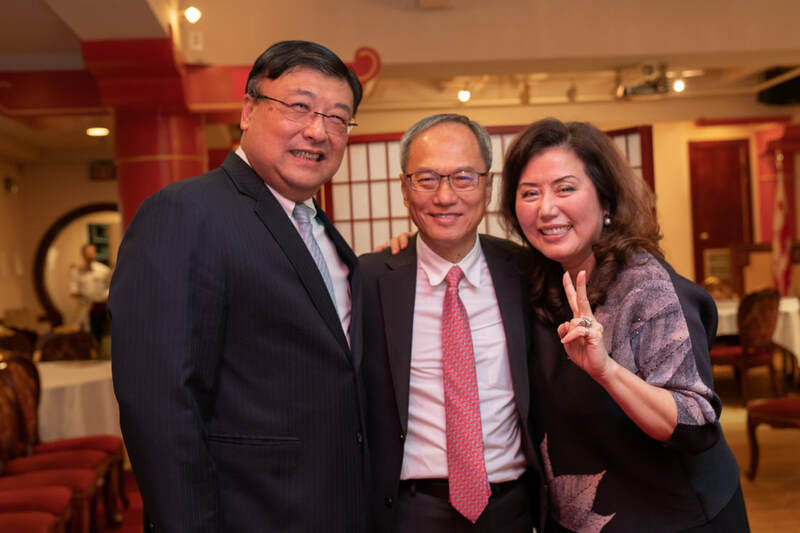 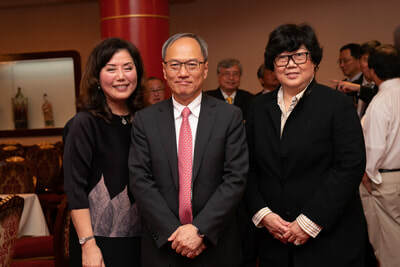 In front of a packed audience at the Wah Luck House in Washington D.C. on Jan 1st, 2018, Chairman Wallace Chan-Man Lee took the Oath of Office for the second time as Chairman of the Chinese Consolidated Benevolent Association (CCBA) and vowed to expand the services to help Chinese immigrants and residents in Washington DC metropolitan area. 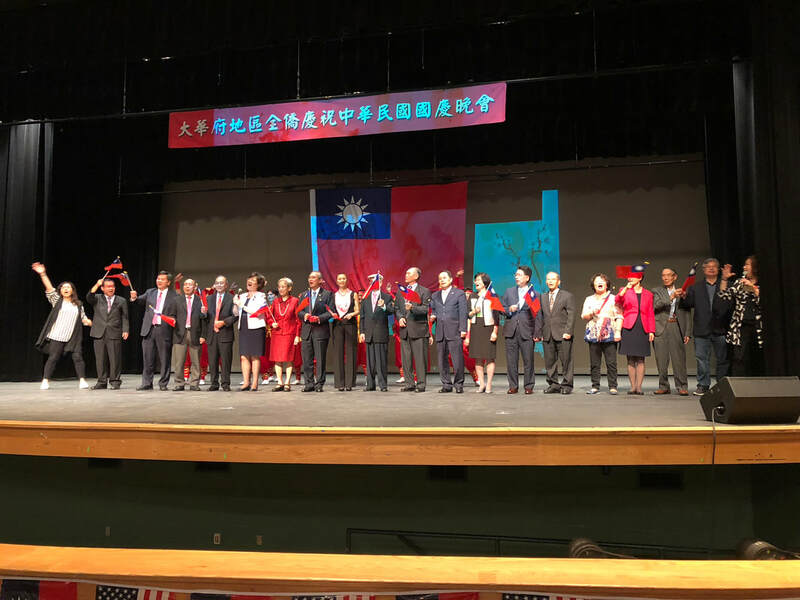 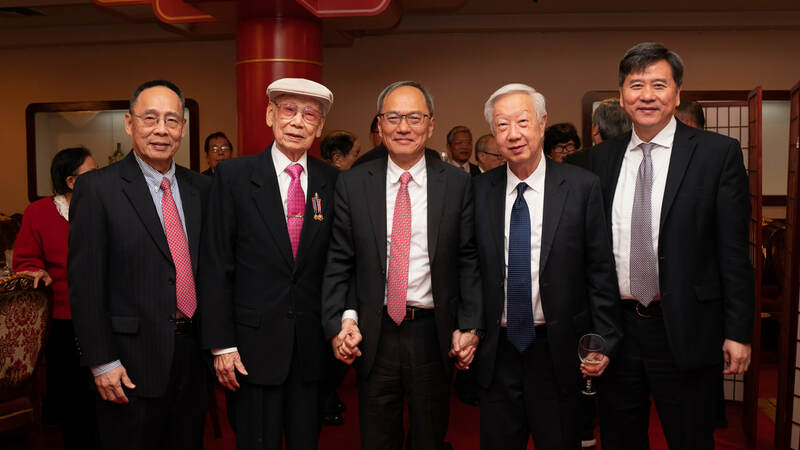 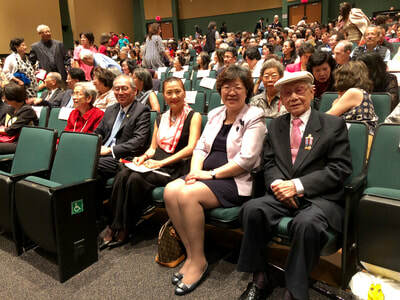 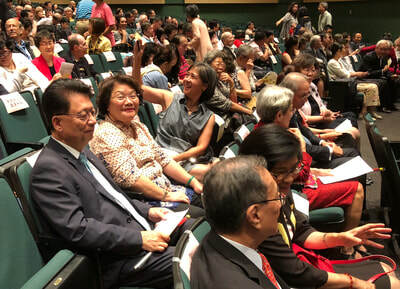 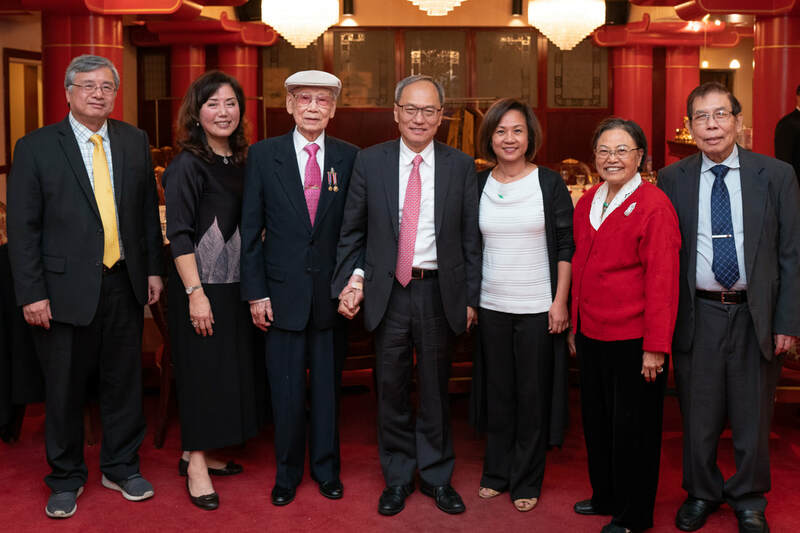 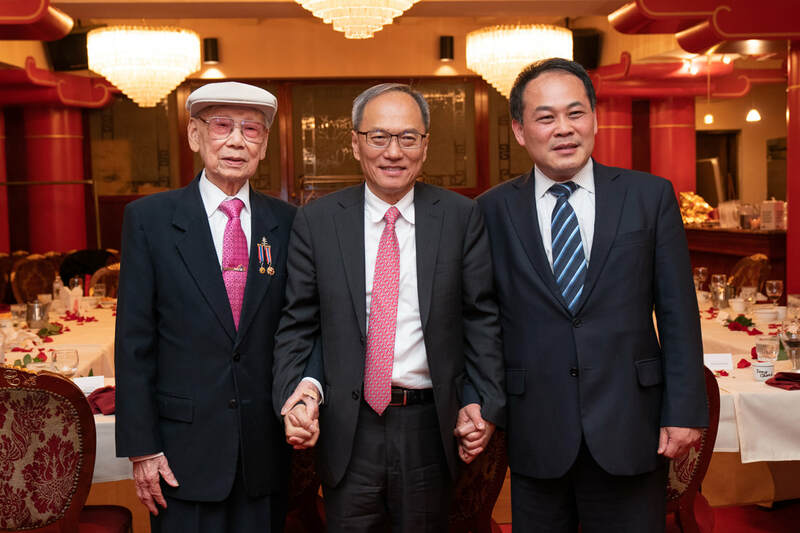 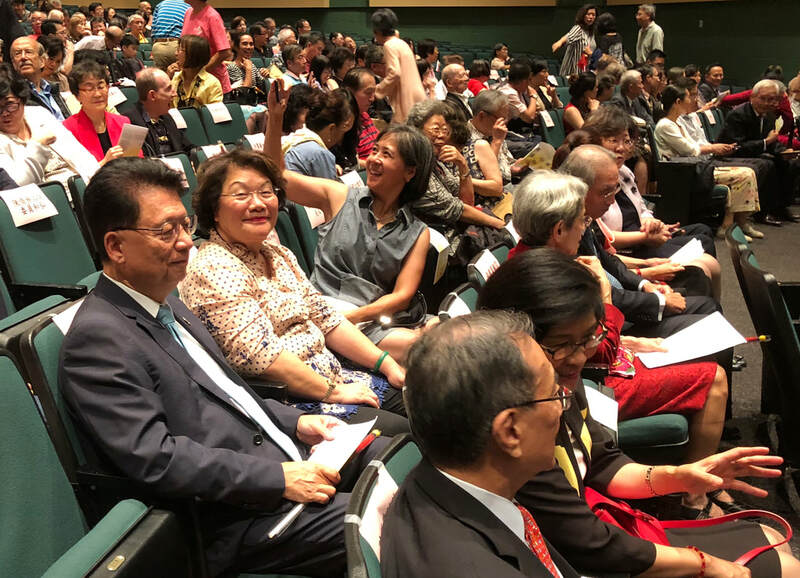 Also sworn in were returning and newly elected staff as well as the Directors of Chinatown Development Corporation and the Chinese Community Foundation. 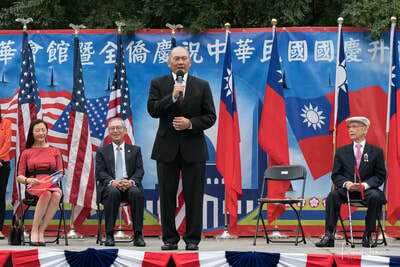 Wallace was administered the oath for his second term by TECRO Representative Stanley Kao presiding over the ceremony. 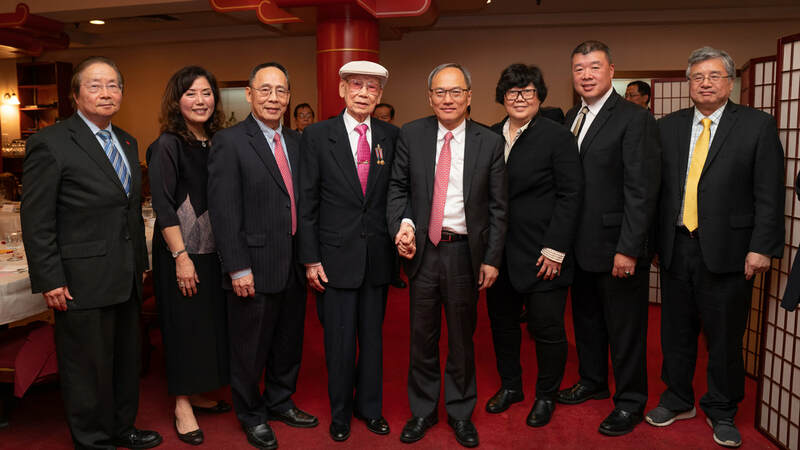 Following the swearing in, Wallace delivered his Inaugural Address where he thanked the team for their service to our community, and for what Wallace called an “example of compassionate volunteer and uncommon strength at a time when the community surely need it." 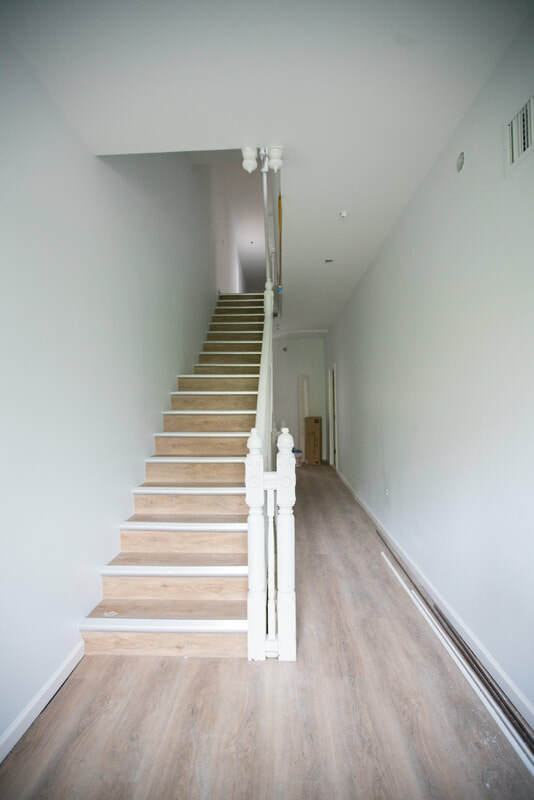 Wallace, who arguably had a very successful first term as Chairman of CCBA and was easily reelected last December, focused on taking CCBA to ‘new heights’ in his speech. 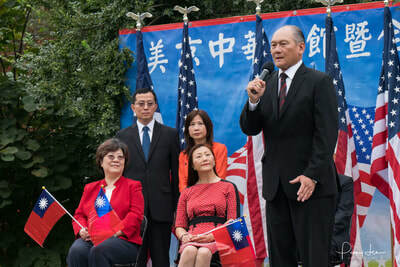 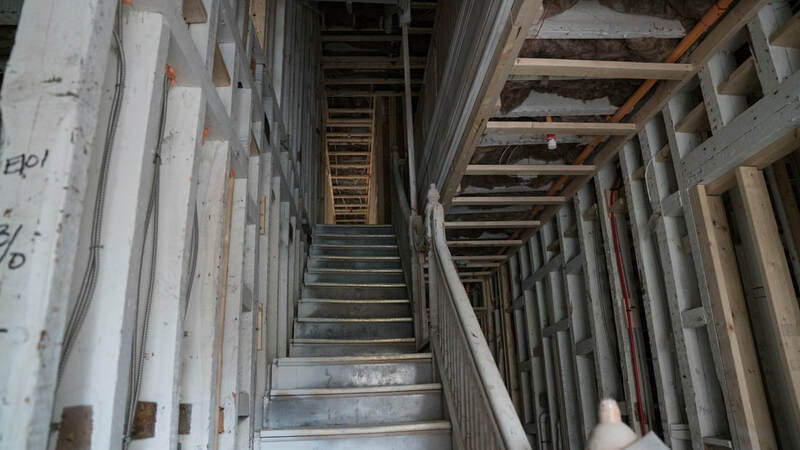 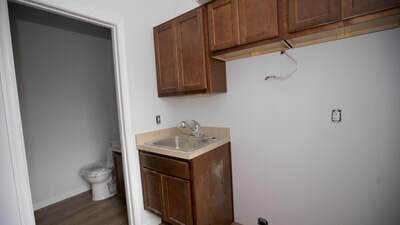 Wallace said he plans to expand existing service programs that are working, rebuilding community infrastructure, increasing affordable service opportunities for immigrants and residents and tackling the free clinics service across the community. 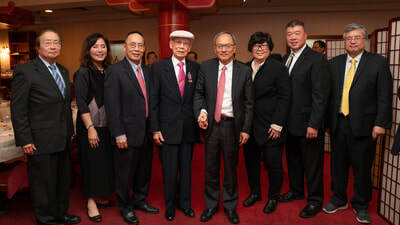 In the end, Wallace said the inauguration marked another step forward as a benevolent association that is, “mindful of our history as a community of purpose and progress; optimistic about our future; and determined to fulfill a vision that grows with each generation. CCBA will continue to march on providing assistance to those who is in need and stand up for our right." said Wallace.